If you have any questions or requests, please feel free to contact the studio. 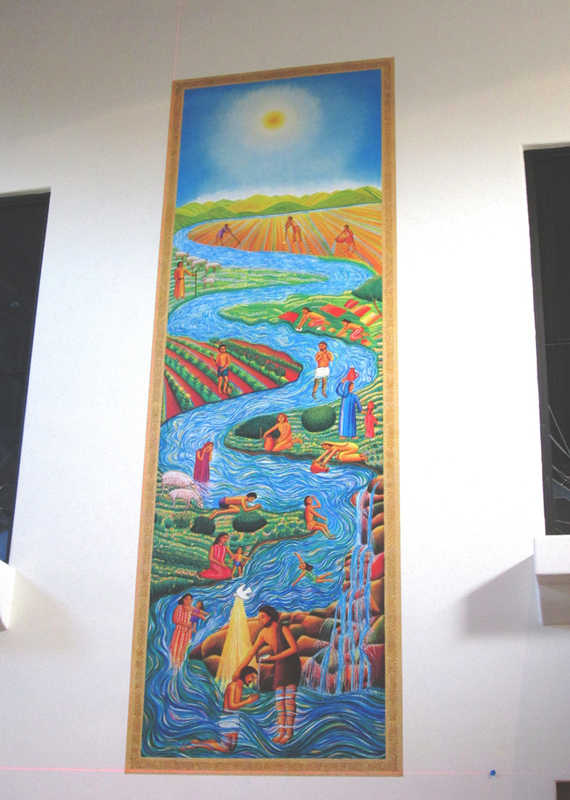 installed two new wall murals of Swanson's artworks: THE RIVER and PSALM 85.
in the sanctuary entrance from Parking Lot 3. 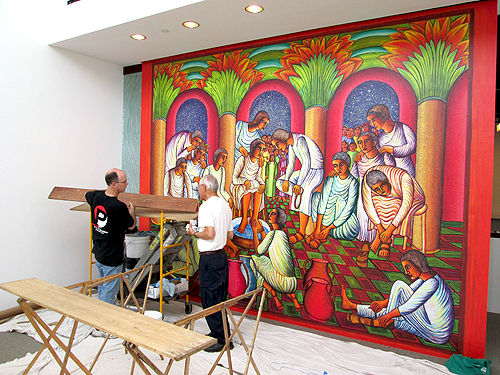 The two murals took many months of work and planning, and were printed by Mpressions - Visual Storytellers in Anaheim. 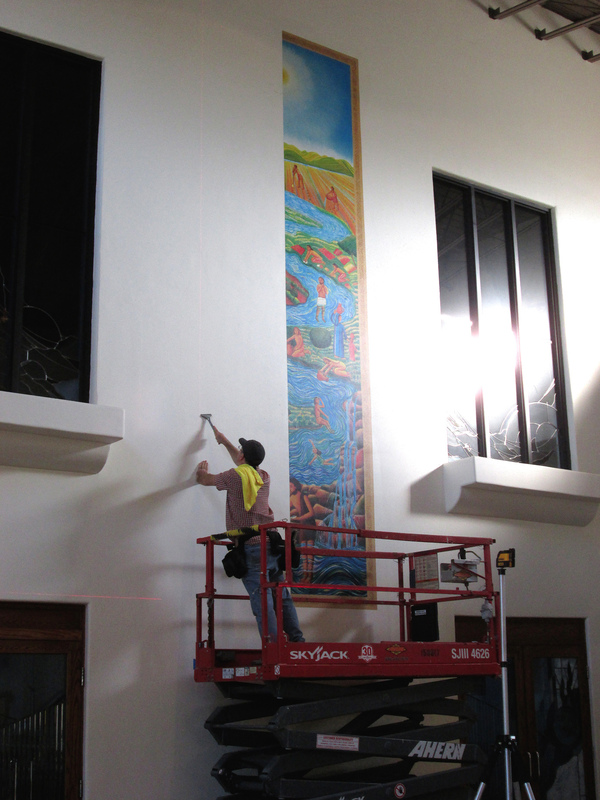 The Swanson Studio is very happy for Ascension Lutheran, and excited to let you know of this new installation. 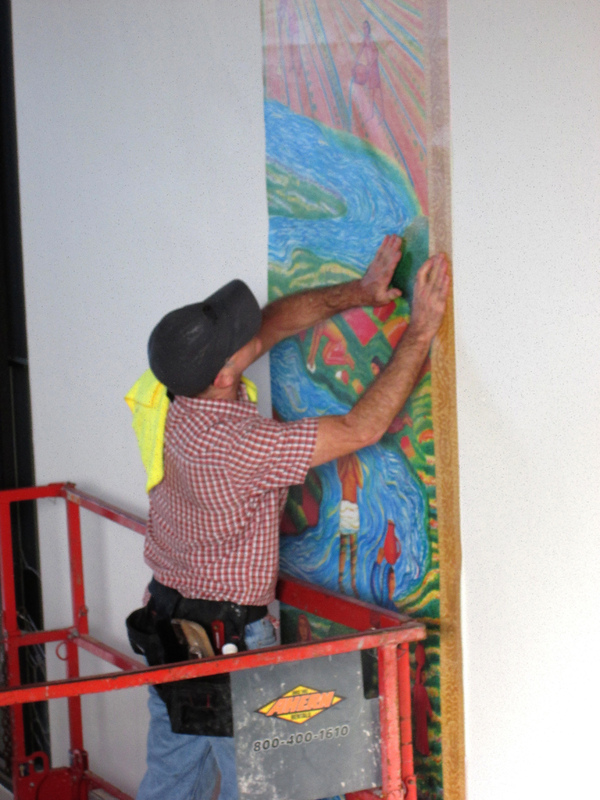 Below are photos taken of the istallation of THE RIVER wall mural, installed on December 22, 2018.
the vinyl wall covering of THE RIVER. 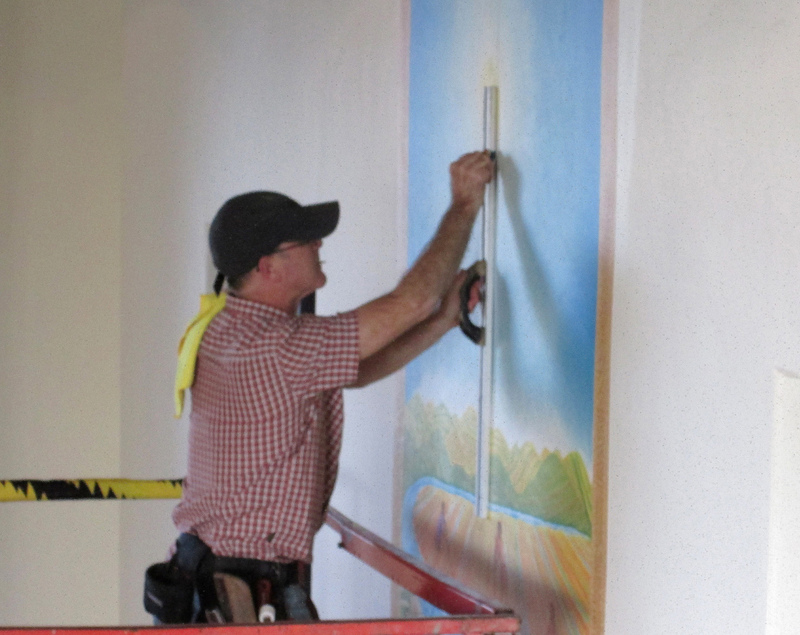 The installer carefully cuts off the excess material from the image. 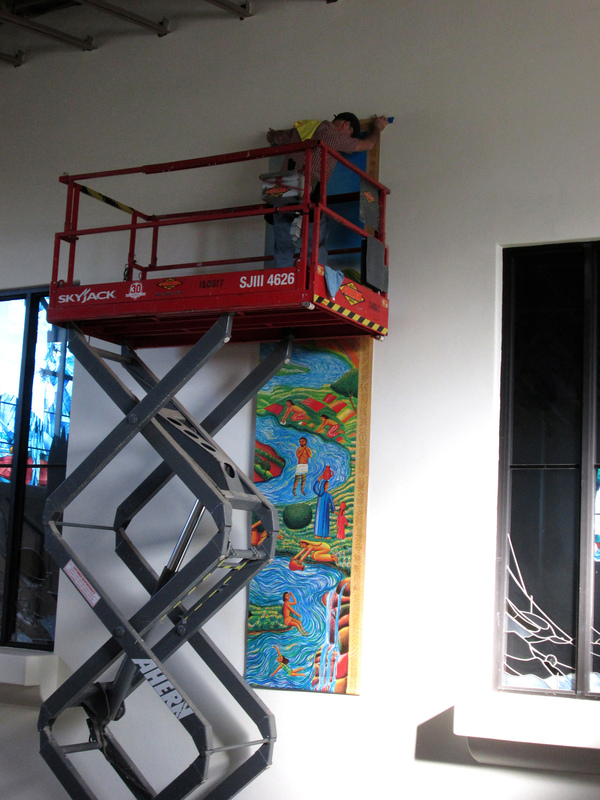 The mural is cut out and ready for the next step. the back of the vinyl. 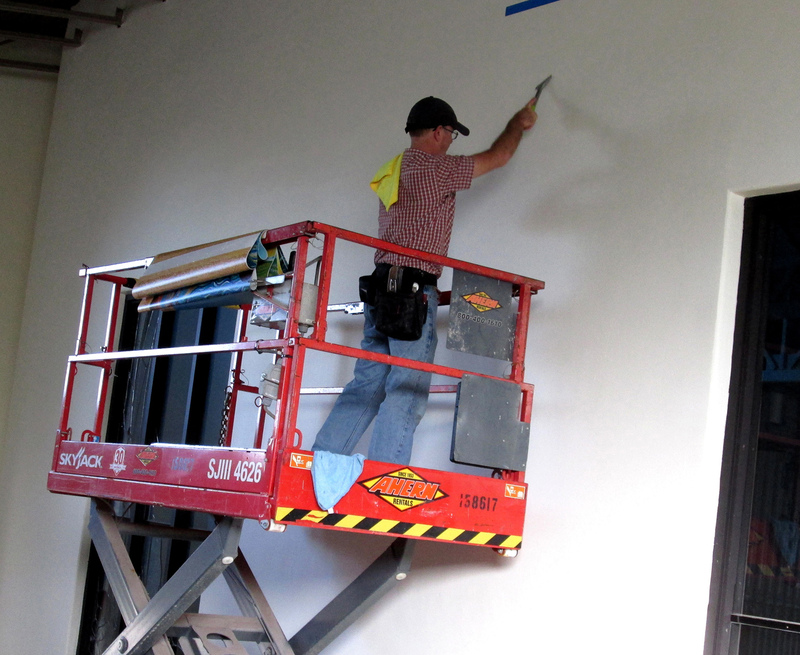 for the adhesive to be applied. 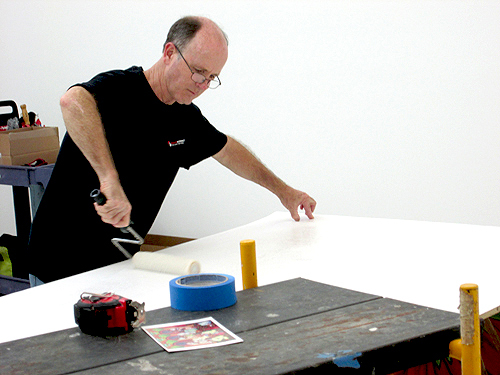 Adhesive is applied with a paint roller brush to the back of the vinyl. 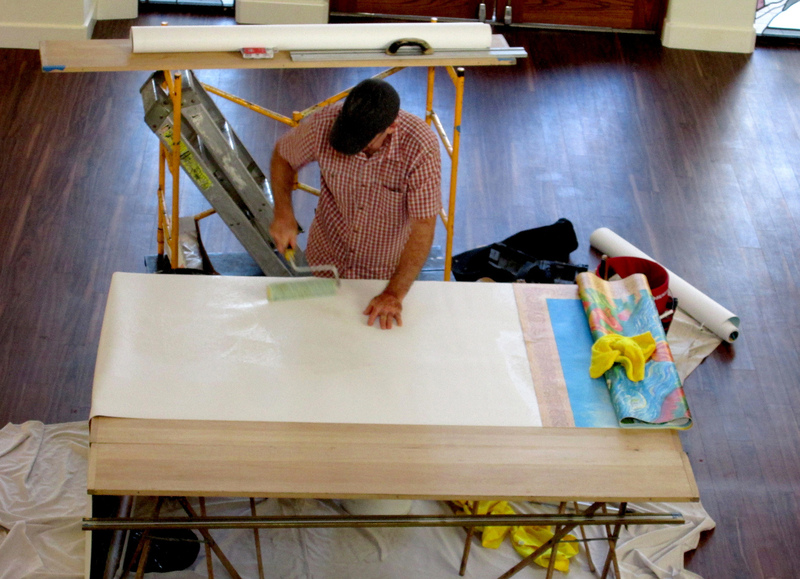 and the installer is folding the strip back to back. 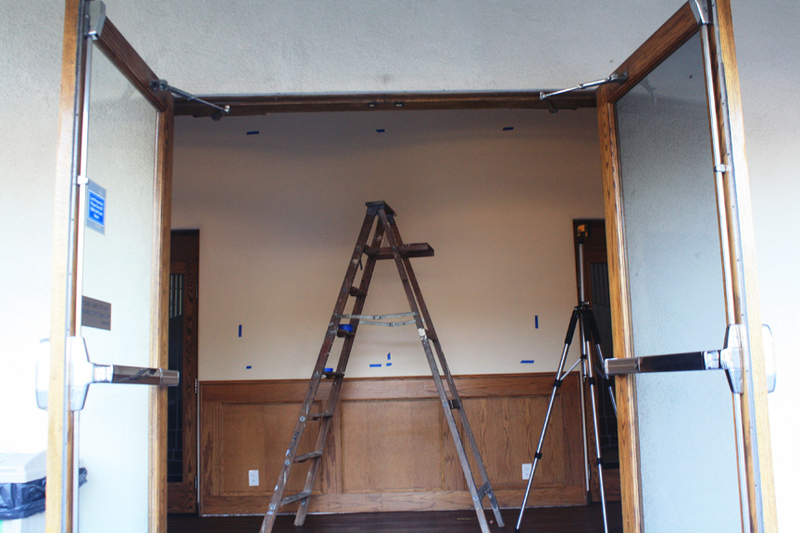 to allow space for work to be done on the lower half. 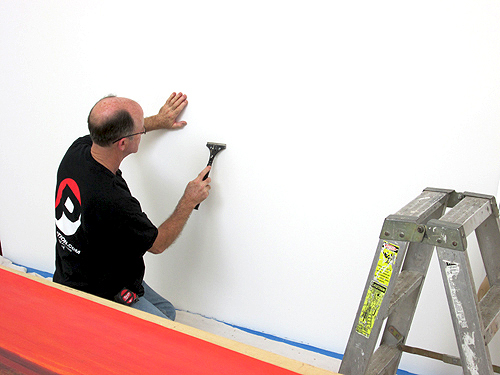 Adhesive is rolled on to the lower half of the first vinyl strip. 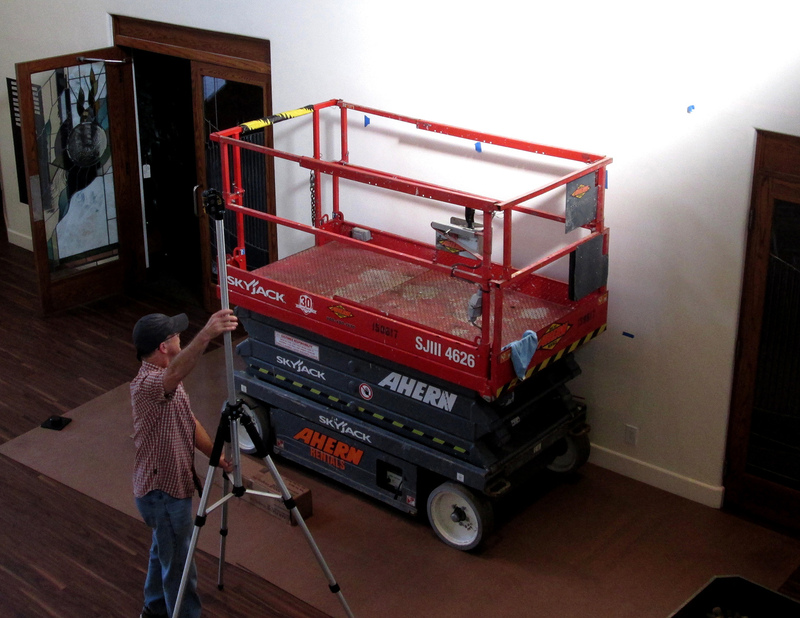 The Installer uses a laser level to mark the alignment for the bottom of the artwork. 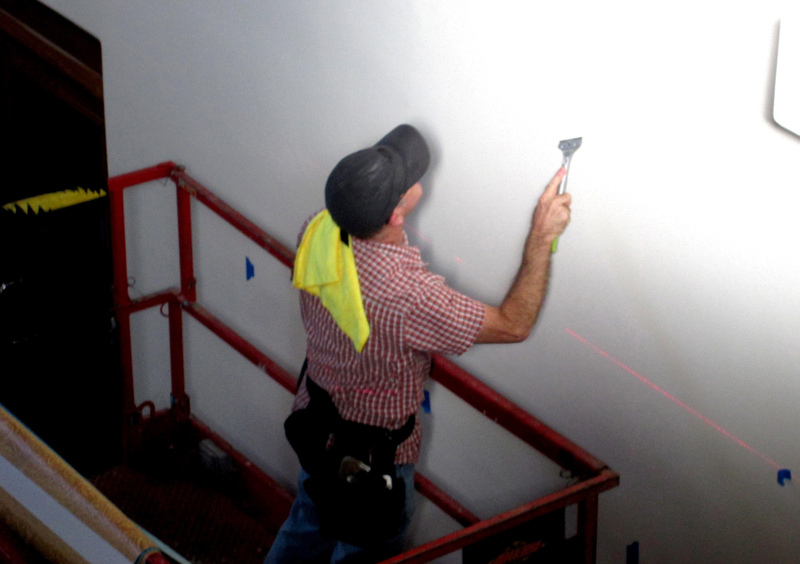 and to smooth the wall for tighter adhesion. and prepares to put it up on the wall. 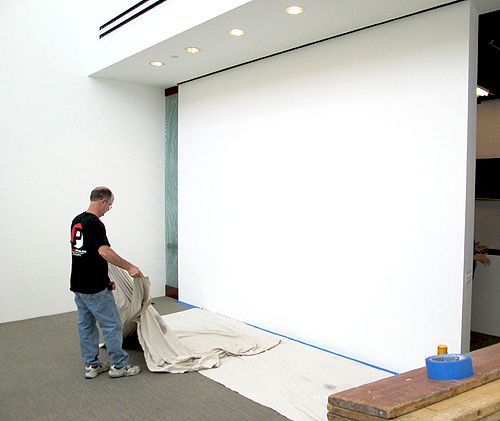 The Installer makes final preparartions to the wall. The first set of folds are unfurled. The second set of folds are unfurled. 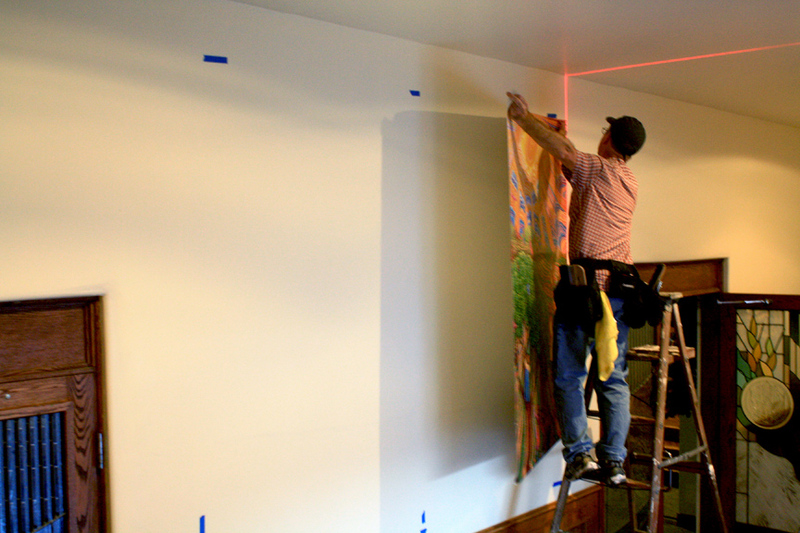 The vinyl strip is placed on the wall. 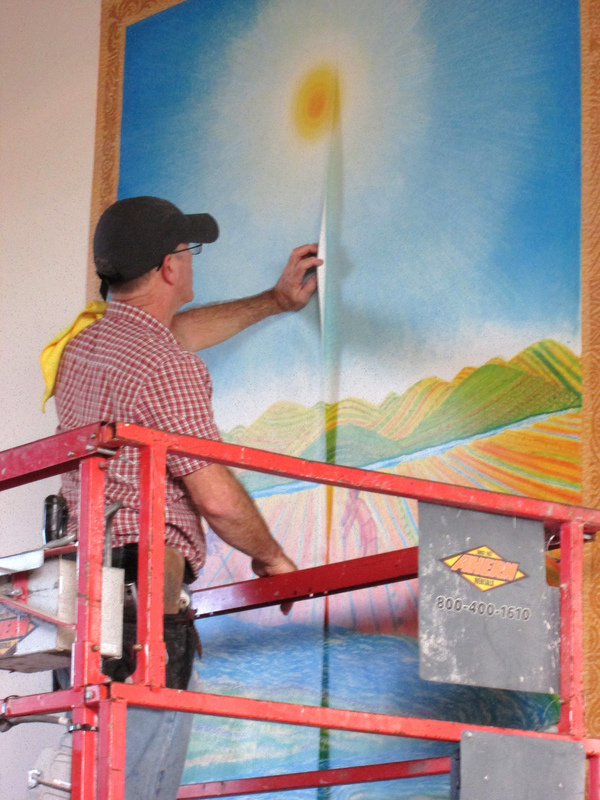 The strip is smoothed by hand into place. 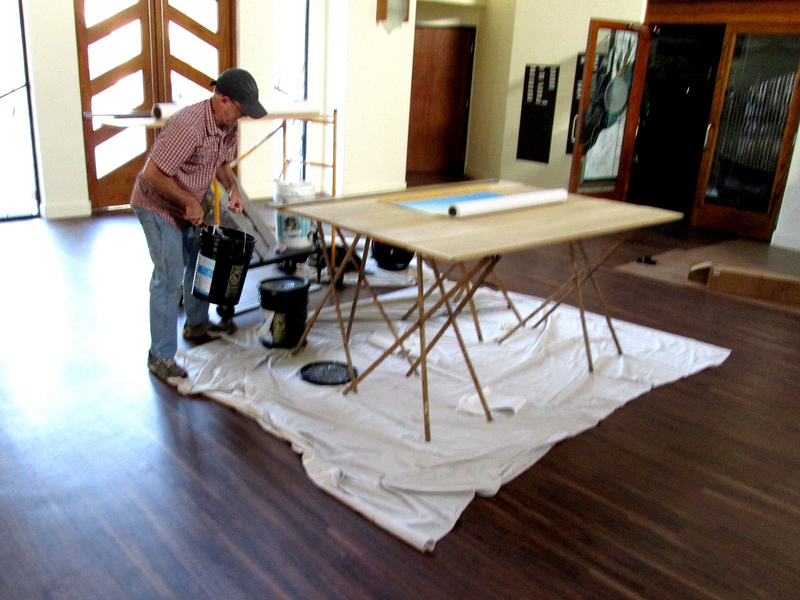 Final smoothing of the vinyl strip is done with squeegees. 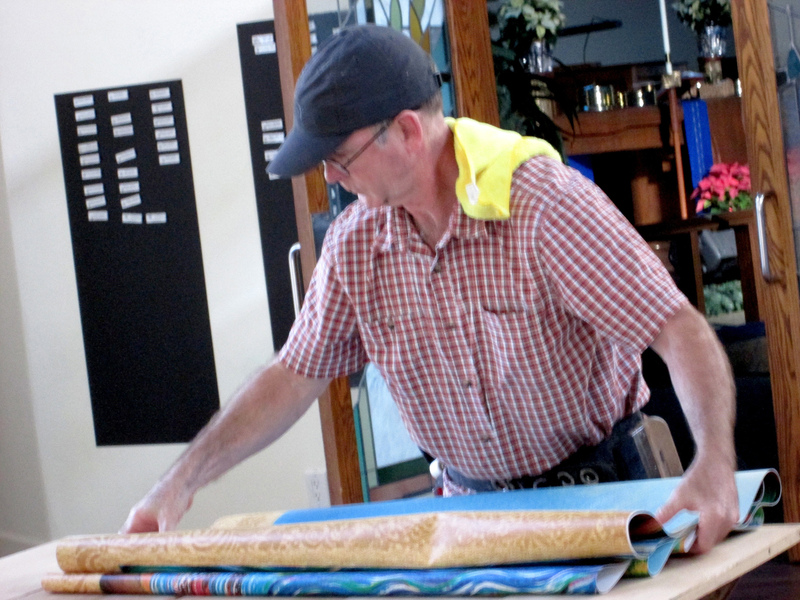 The process is repeated for the second vinyl strip. 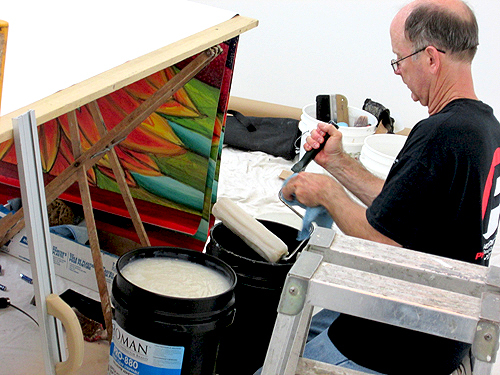 Adhesive is applied, and the second strip is folded. The other half of the wall is prepared for the second half. 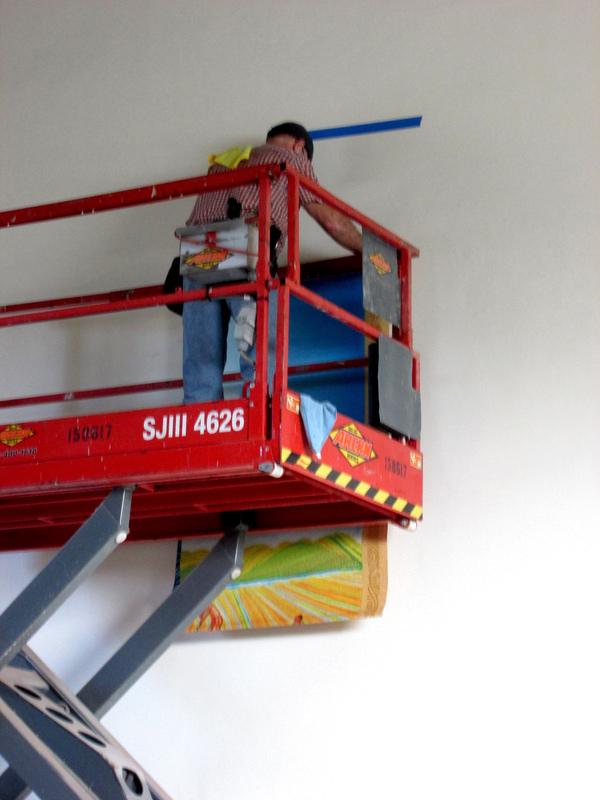 An overlap between the two strips is used for final alignment. ... and removed, to create a seemless image. 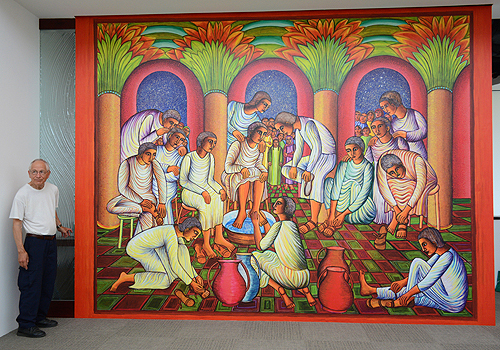 The newly installed wall mural. 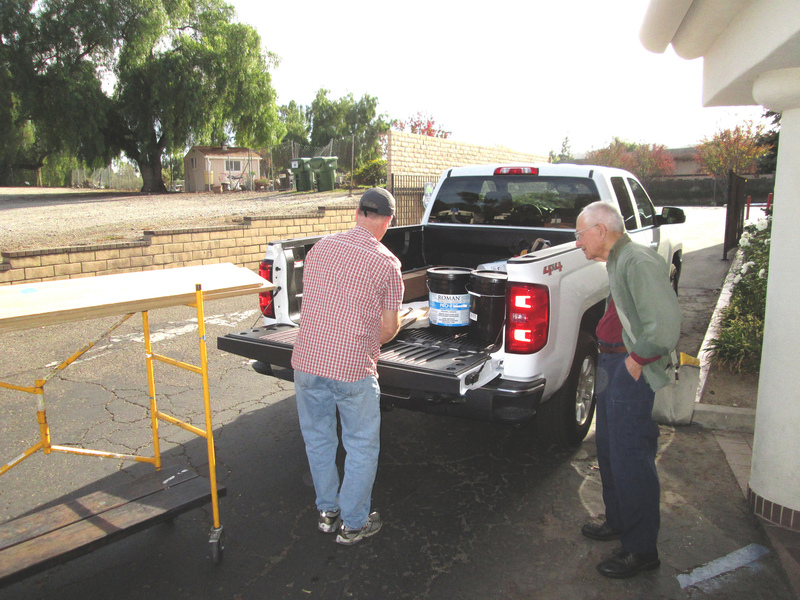 John August Swanson with Pastor Steve Herder. 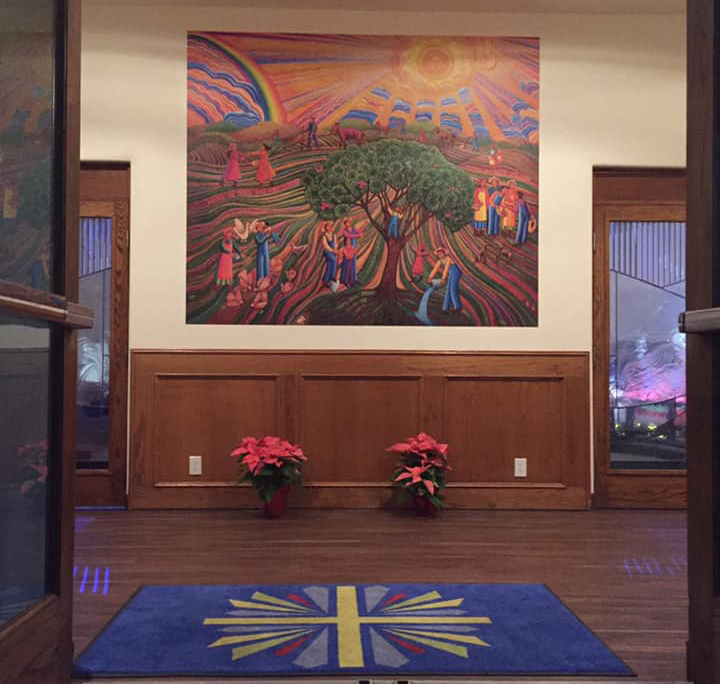 Ascension Lutheran Narthex with the newly installed wall mural. 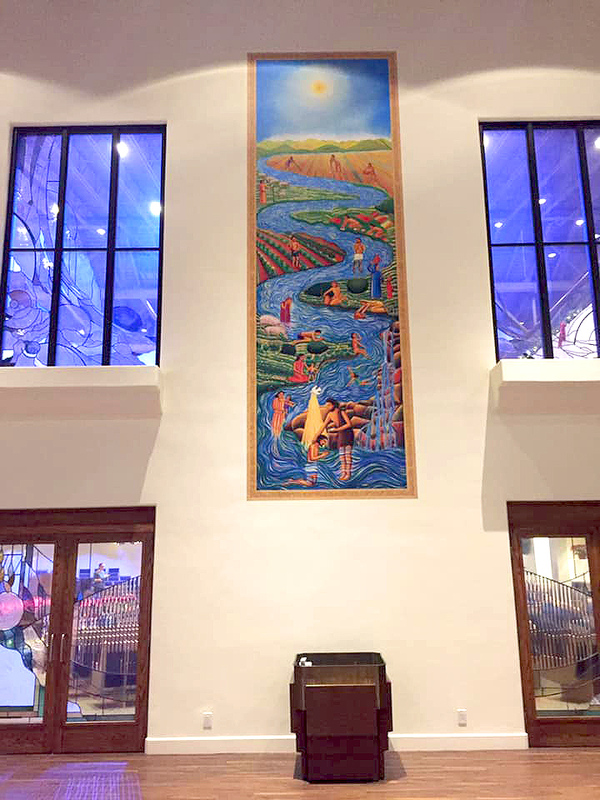 Below are photos taken of the istallation of the PSALM 85 wall mural, also installed on Dec. 22, 2018. 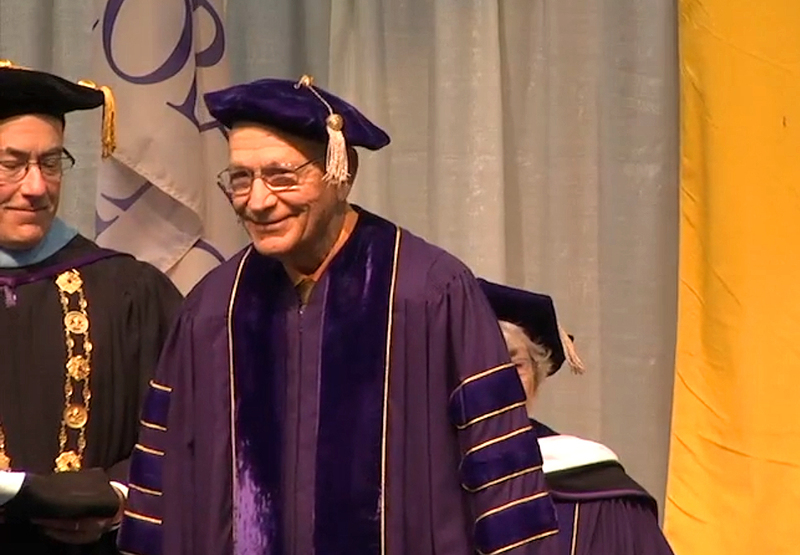 On Saturday, May 19, 2018, John August Swanson was bestowed an Honorary Doctor of Letters from Loras College in Dubuque, IA. 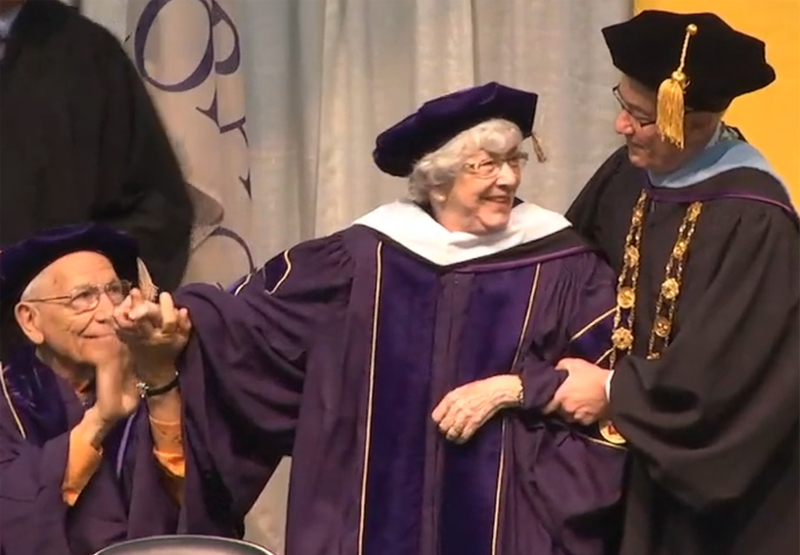 During the ceremony, Janaan Manternach, who will be donating her extensive collection of Swanson artworks to Loras College, also received an Honorary Doctor of Letters degree. 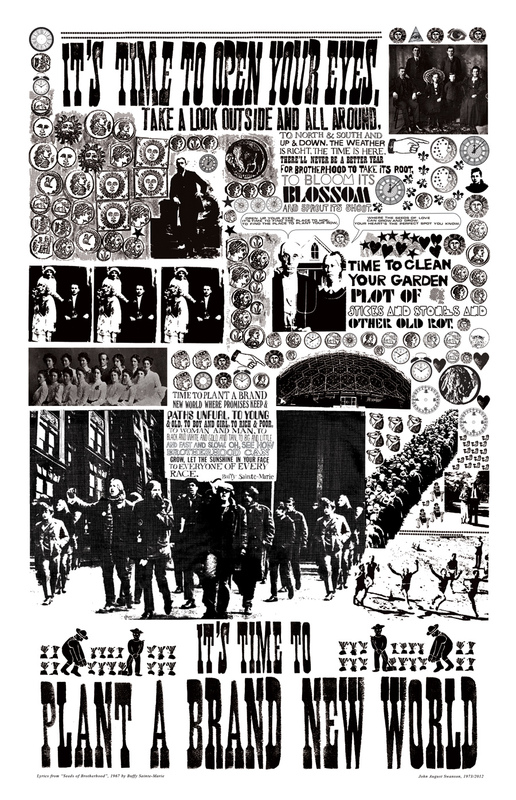 I approached my MARTIN LUTHER KING poster with the intent to create a new artwork in my “Exploding Newspaper” style, used previously in BIG HUNGRY EYE (1971), LET US NOW PRAISE FAMOUS MEN (1972), STRUGGLE FOR JUSTICE (1972; re-issued in 2011), and SEEDS OF BROTHERHOOD (1973; re-issued in 2012). In these works, I used a variety of typefaces from alphabets I hand-carved from rubber erasers, while taking Sister Corita Kent’s class at Immaculate Heart College in 1968. My earlier posters were planned around, and mainly used, photographs, which were interspersed with song lyrics and quoted text. For this work, I chose to use my own drawings. 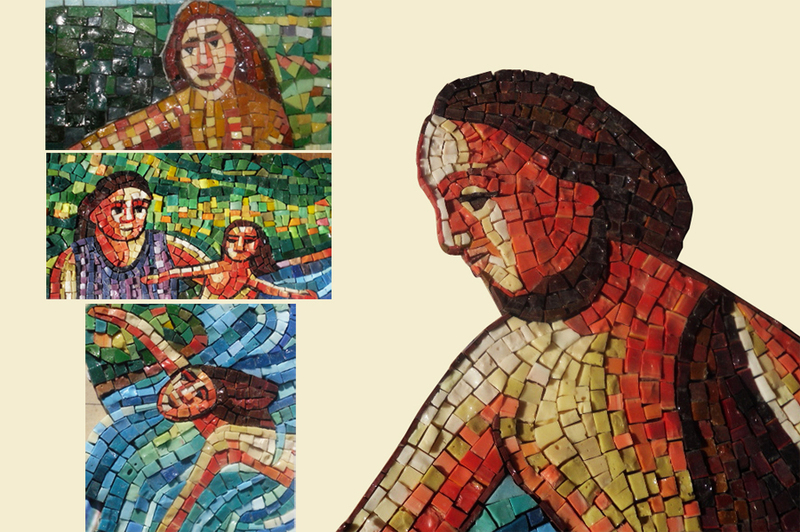 These details have been taken from the paintings, prints, and sketches I have completed over a wide spectrum of my work. 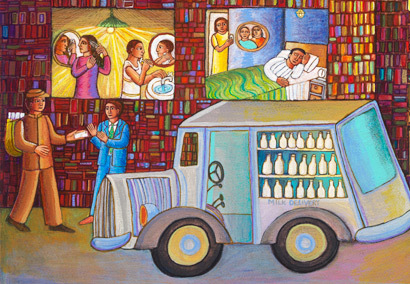 The scenes depict people engaged in their daily lives, and form my own visual commentary on Dr. Martin Luther King’s marvelous text. 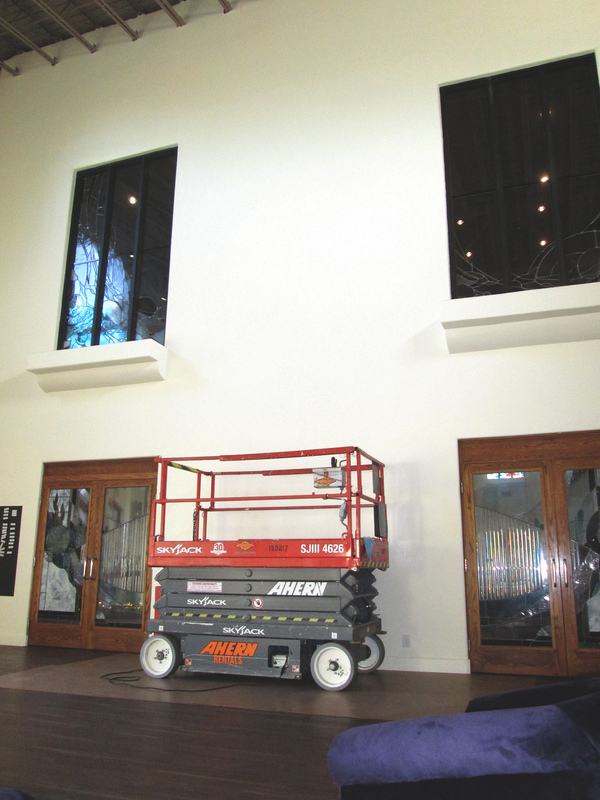 However, within the artwork, there is still a photo of Dr. Martin Luther King, Jr. It was taken in a jail cell at the Jefferson County Courthouse in Birmingham, Alabama, October, 1967. 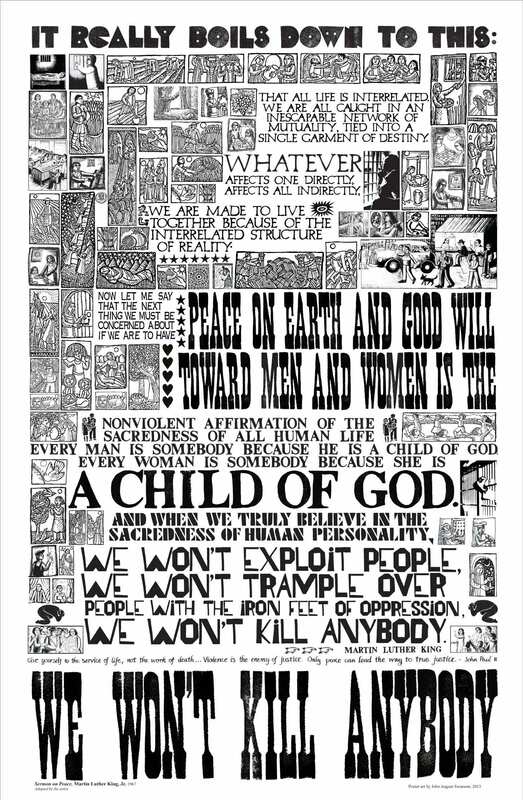 The poster’s text is drawn from Dr. King’s 1967 Christmas Sermon on Peace, delivered at Ebenezer Baptist Church in Atlanta, Georgia. The Canadian Broadcasting Corporation aired the sermon as a part of their distinguished authorities and contemporary interest program, the Massey Lecture series. Dr. King’s affirmation of our universal connection to one another, our inextricable interdependence, moved me. It is still a contemporary, powerful, and relevant message, as we continue learning how to live together, how to work together, and how to peacefully coexist. 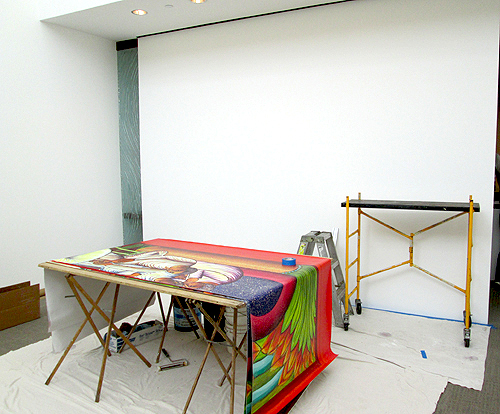 Please call the John August Swanson studio at 310-649-1210 for more information. 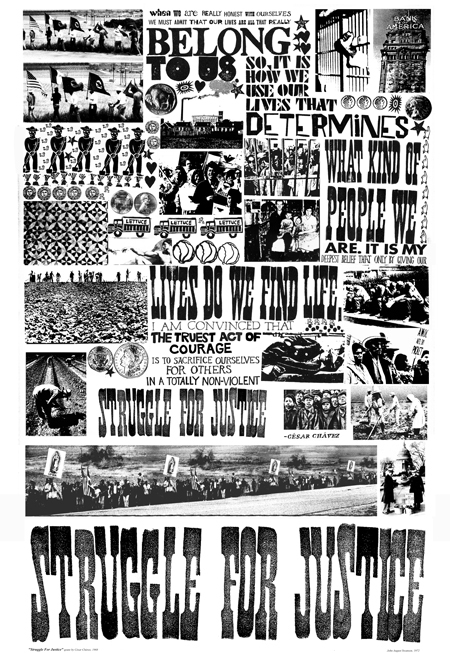 Collage Poster printed as an offset lithograph, 31" x 20"
When I was starting my work as an artist from 1968 to 1975, I was influenced by political ideas and movements, and the songs and speeches of the 1960s and 70s. I created a series of works similar to newspapers-collages of lettering, artwork, and photos, an "exploding newspaper." I used a large variety of imagery, from photographs to my own hand carved rubberstamps, to create visual interest. It was a good opportunity to incorporate the lettering and alphabets I had carved in my mentor Corita Kent's lettering class. Using my knowledge of photography, and working in darkrooms, I overexposed photographs to simplify them, and create stark solarized images, which I felt complimented the lettering. I combined the lettering, photos and rubberstamp images with texts that were meaningful to me: the words of the writer, James Agee; the poet, Lawrence Ferlinghetti; and the labor leader, Cesar Chavez; as well as song lyrics. Buffy Sainte-Marie was a strong minstrel, who wrote songs that were about her people's history, the Native Americans, and about peace and political consciousness. I chose the song she wrote in 1968 for Brotherhood Week, Seeds of Brotherhood, to create one of these "exploding newspapers." The lyrics are so playful, yet they deal with the importance of understanding, compassion, and empowerment. Yes, we can create a better place where everyone can live! To north and south and up and down. The weather is right, the time is here. To bloom its blossom and sprout its shoot. 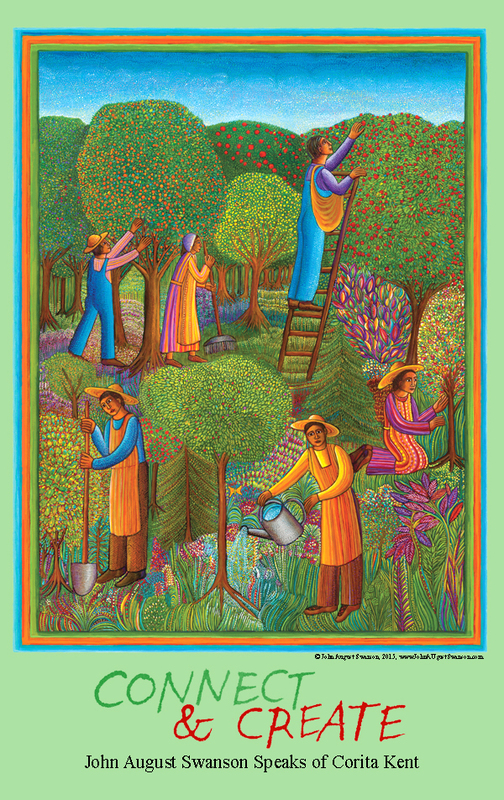 Where the seeds of love can grow and grow. Your heart's the perfect spot, you know. Of sticks and stones and other old rot. To big and little, and fast and slow. To everyone of every race. 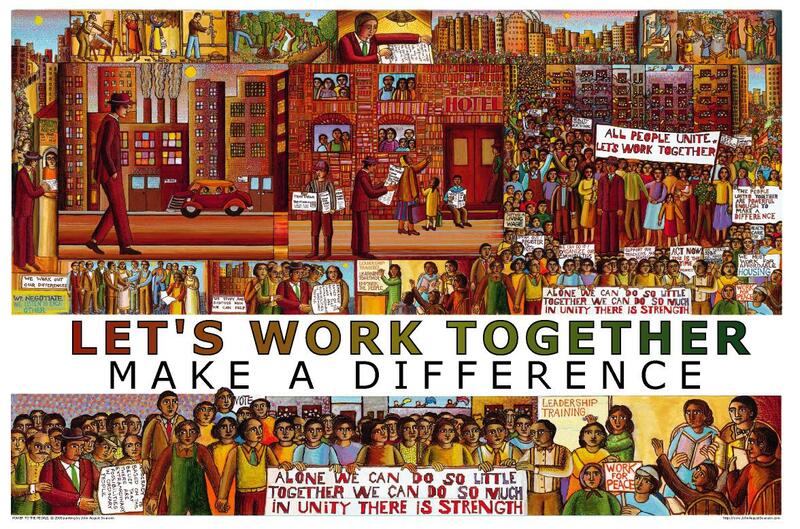 The poster, STRUGGLE FOR JUSTICE, was first created forty years ago, in 1972 to help raise money for the United Farm Workers. 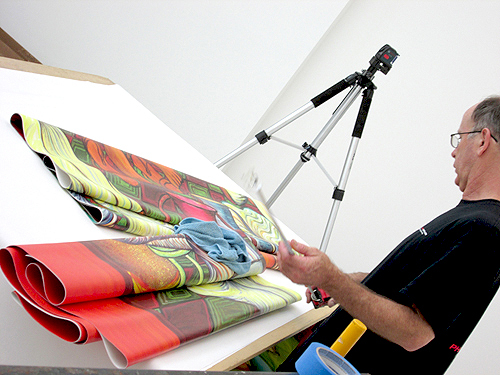 The original printing was limited to one hundred posters. As I recall, the union provided me with a statement from Cesar Chavez’s 1968 speech. My idea for the poster design was to use his words to create a “newspaper,” a black and white montage of photos and lettering. For the lettering, I used a variety of typefaces; many of these were rubber-stamp alphabets I had carved from rubber erasers and other materials. 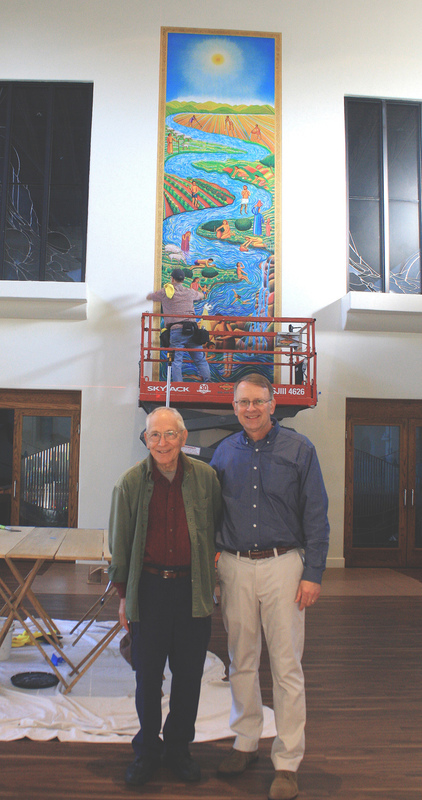 His words became my “headlines,” accompanied by images showing the struggles of the United Farm Workers in our agricultural fields and the attacks from the giant agribusiness corporations. I also used other photos depicting labor, race, and economic struggles throughout the 20th century in the United States. I interspersed the words and photo images, hoping that this would be an interesting design and would best communicate the message of our continuing struggle to bring justice for all. 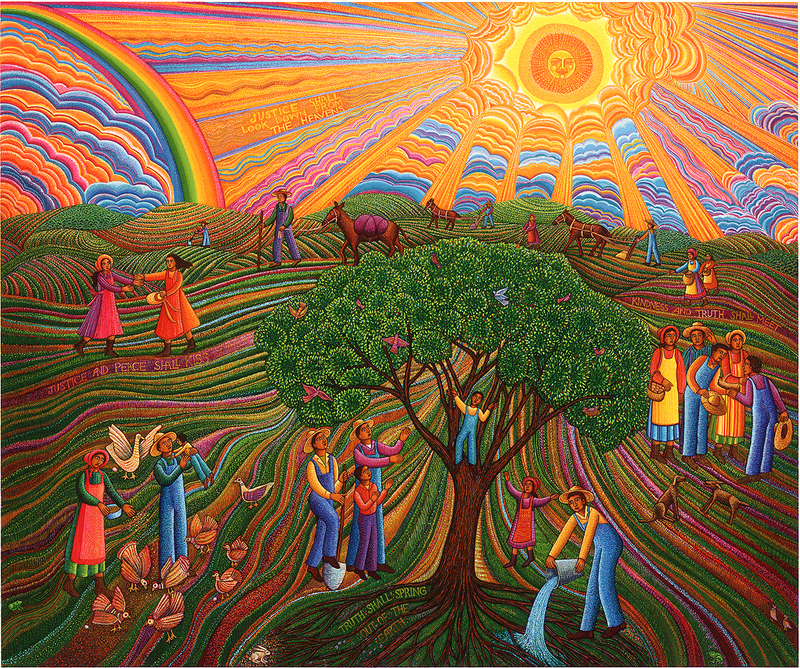 In 2011, I felt the message still resonated with strong grass-root movements: the energetic actions of the Occupy Movement, the growing awareness and participation of the Global Warming and Environmental Movements, the struggle of workers to protect their labor unions, and the renewed effort of the Peace Movement. I decided the poster should be reprinted. The original poster was revised with new images, revised spacing, and adapted text. Now, I hope this poster will bring Chávez’s powerful words to students, to union workers, and to those who struggle for justice. I hope this work will encourage, strengthen, and empower those who seek a just and peaceful world. on Thursday, November 30th and Friday, December 1st. as well as his series of 13"x19" posters. 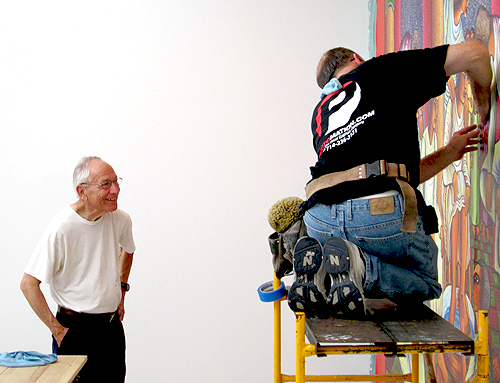 or call them at 619-296-3161.
on Corita Kent's artwork, and her influence on him. 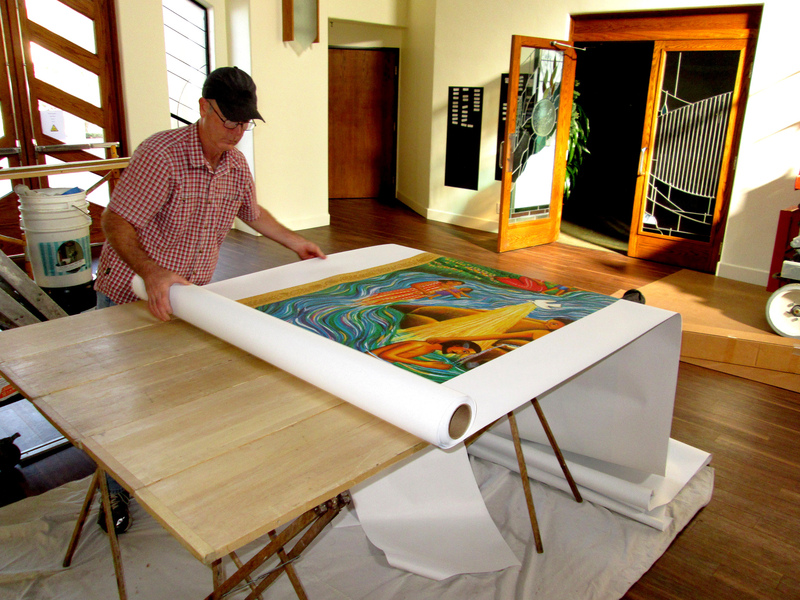 Janaan Manternach's collection of John August Swanson artworks. given by Janaan Manternach in the Babka Theatre. 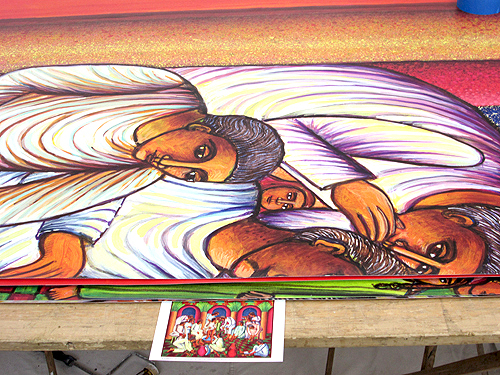 laboriously translates them into these serigraphs. These images are a tour de force of color, design and complex composition. But without a doubt, their origin is equally based upon the artist’s commitment to story-telling, and it is this aspect that I wish to explore. . .
download this 28-page, full color catalog. 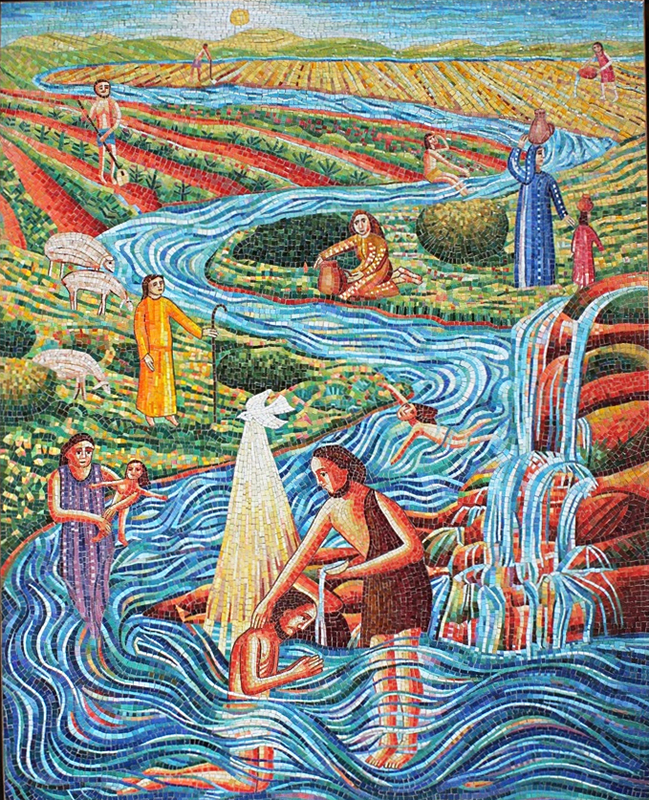 WASHING OF THE FEET II. 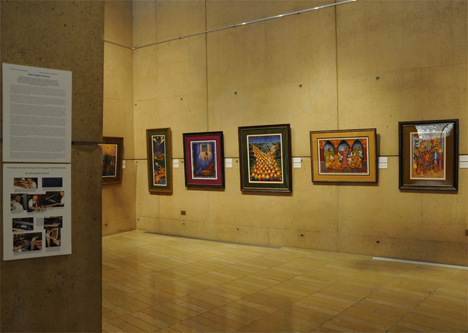 and is located on the third floor of the Christ Cathedral Cultural Center. 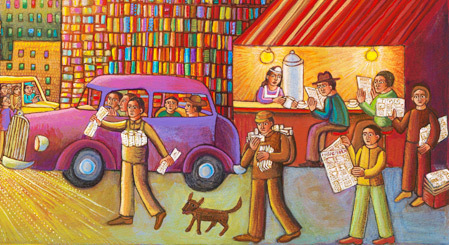 The original, 23” x 29½”, acrylic painting from 1999 was scanned by ArtScans Studio in Los Angeles at 512dpi. before it was sent to Photomation in Anaheim for final adjustments and printing. 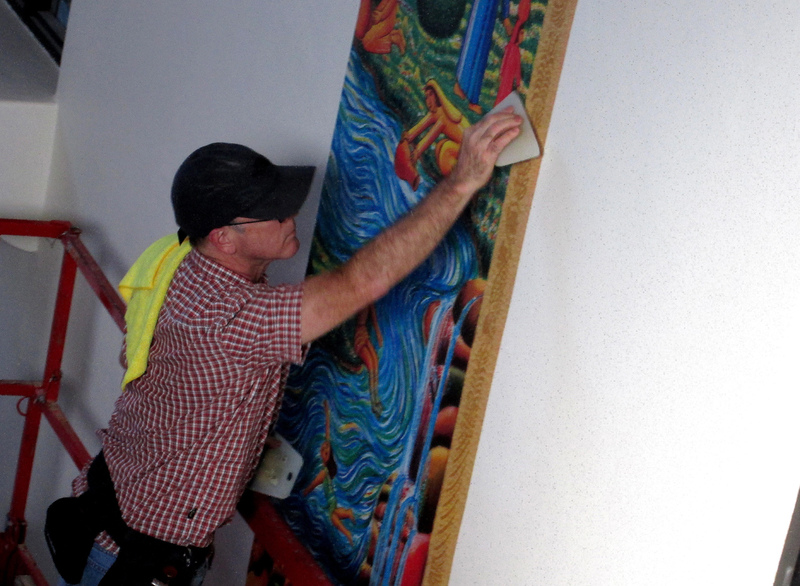 and, on June 29, 2015, the artist was present for the hanging and installation of the artwork. 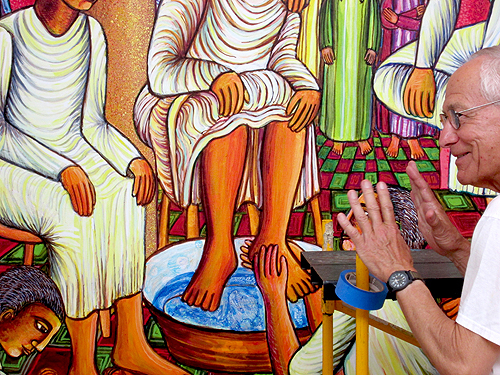 Below are photos taken of the Washing Of The Feet II wall mural installation done for Christ Cathedral in Orange County on June 29, 2015. 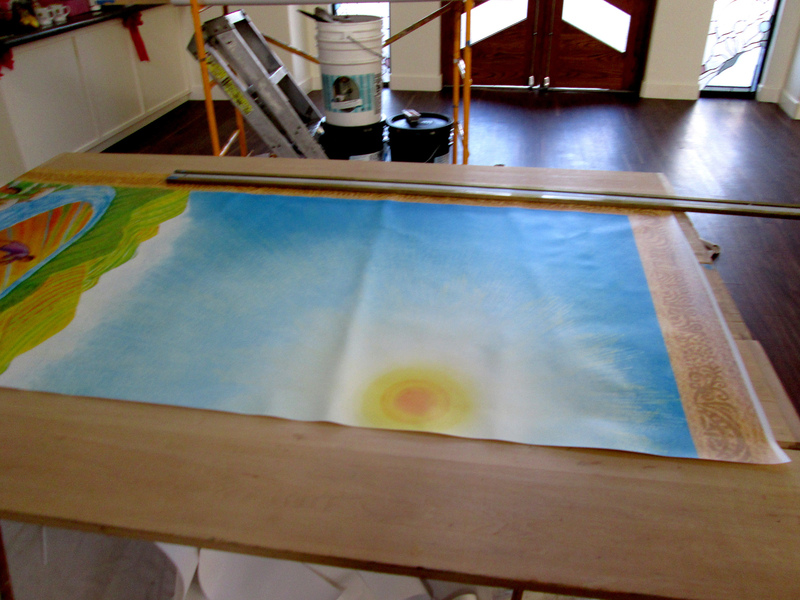 The first vinyl strip is positioned. 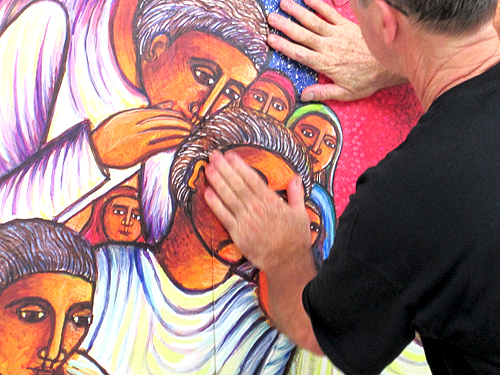 The theme of this artwork encourages us to show true humility of spirit, and love for all. It gives us a beautiful guide for our lives. 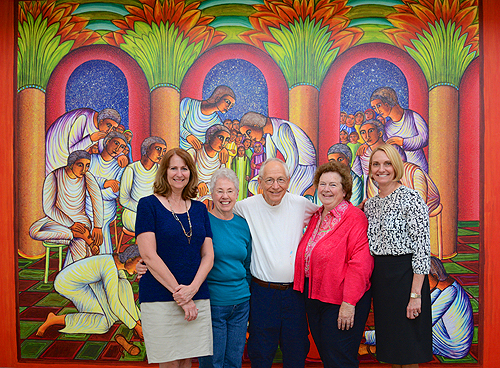 We are called to treat all with respect, and to serve our community. True leaders are those who are called to serve. 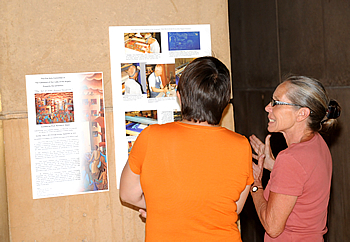 and the exhibit is open for viewing from 8:30am until 5:00pm. 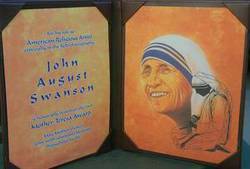 original John August Swanson artworks will be on shown at the Acton Institute For The Study of Religion and Liberty. 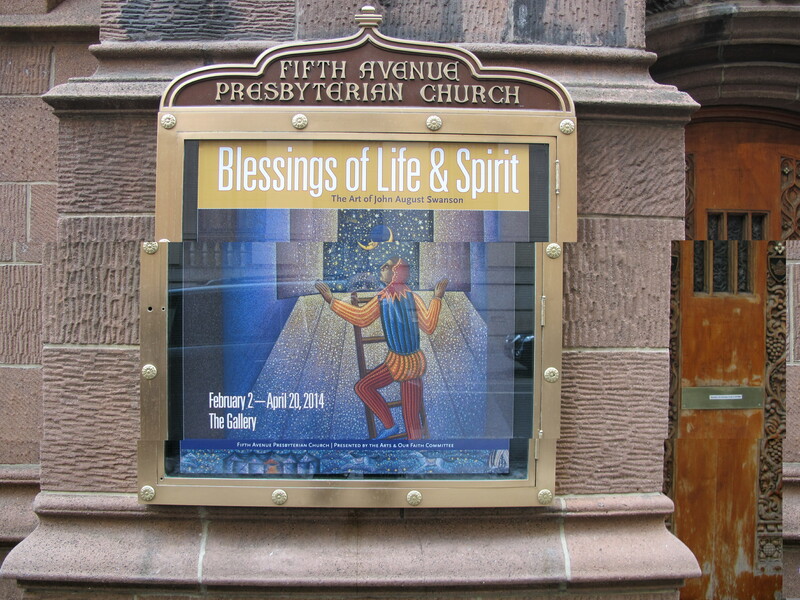 Click Here to view exhibit booklet. John August Swanson will be attending the Who Is My Neighbor? 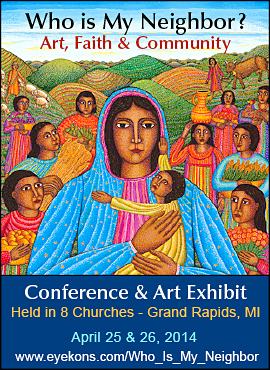 conference in Grand Rapids, Michigan, April 26th and 27th. 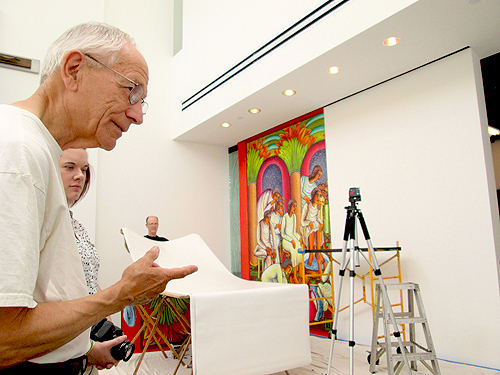 Two large collections of his artwork (The De Vos Collection and the Bergsma Collection) will be exhibited, and Mr. Swanson will participate in several panel discussions and presentations. The full schedule is available at this link. Registration for the event is open and can be completed, here. For more information, please call: 616-235-2929.
now through Sunday, April 27th. 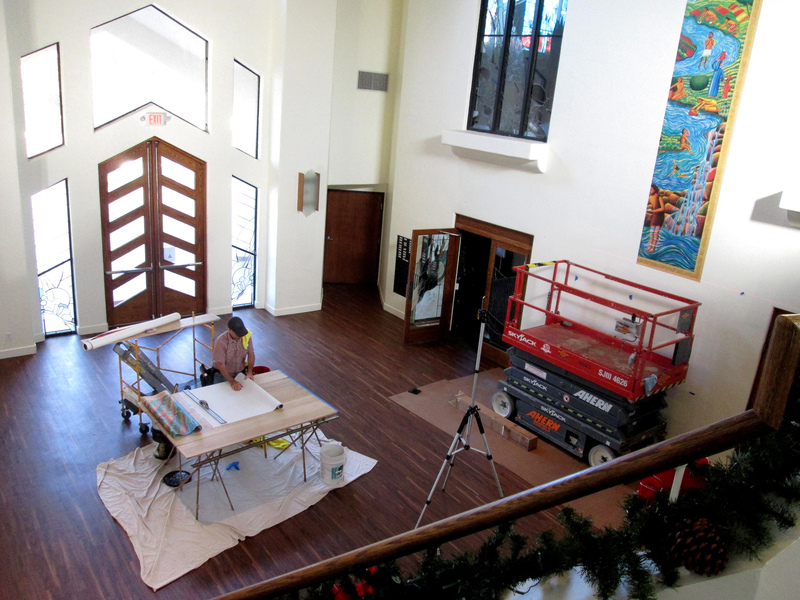 On Palm Sunday, April 13th, the artist will be in attendance between noon and 3pm. He will give a talk beginning at 1pm. This event will be free and open to the public. 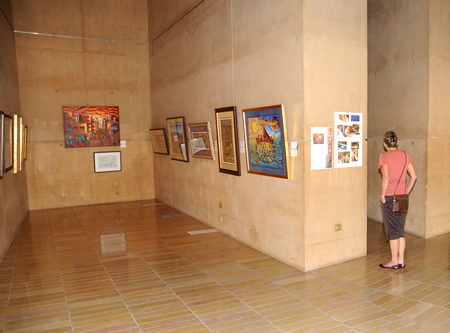 The exhibit is open Sundays 1pm to 3pm and by appointment on Wednesdays between 1pm and 3pm. from Sunday, February 2nd until Sunday, April 20th. from Friday, September 13th until Sunday, September 15th. 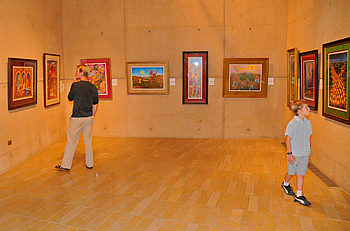 Admission is free and open to the public Saturday and Sunday. 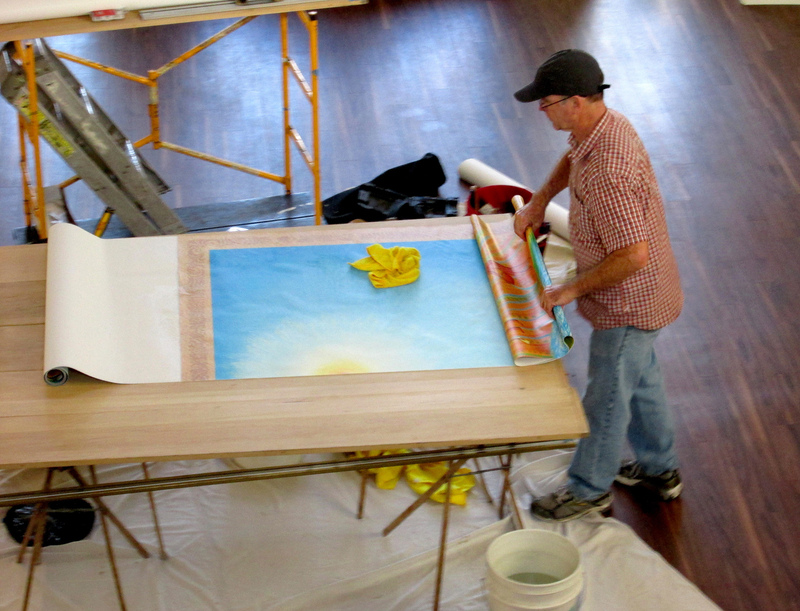 Tickets for Friday evening's reception are available at St. James By-The-Sea's website. 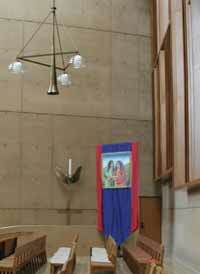 in their St. Kateri Room. 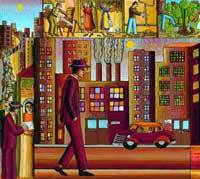 John August Swanson has finished his newest highly detailed and vibrantly colored artwork, MORNING IN THE CITY. illustrate our own unique potential for greatness while facing the challenges of a new day. conducted an interview with John August Swanson, and created a short, six-minute, video based on his responses. and Reform the Three Strikes Law in California! 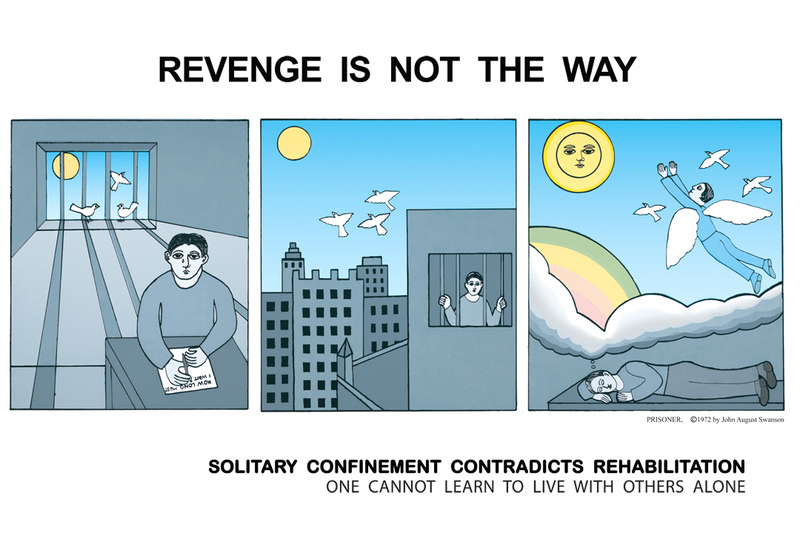 has prepared four posters and postcards calling for an end to State Sponsored Execution in California, and a postcard to change the Three-Strikes Law. Proposition 34 on the Nov. 6th ballot would repeal the death penalty in the State of California and impose a mandatory sentence of life in prison without the possibility of parole for the 729 persons sentenced to death in our state. 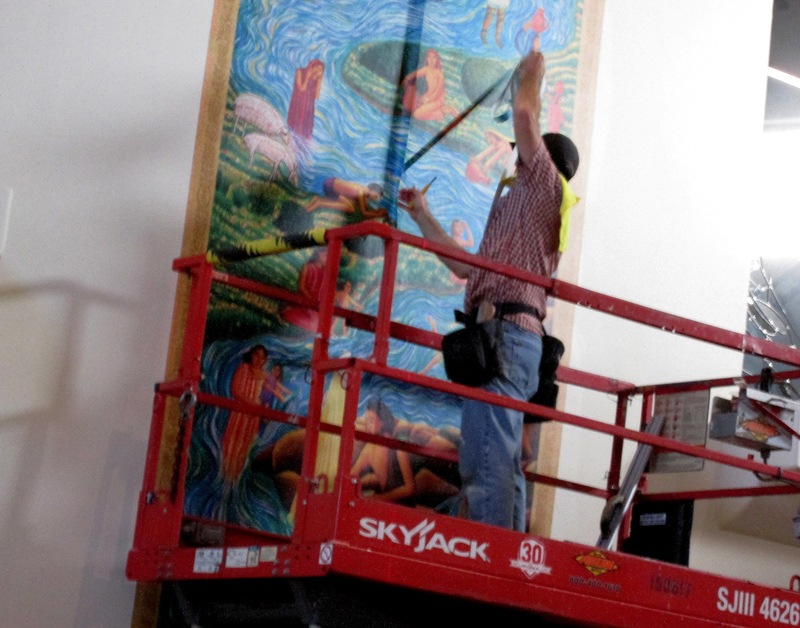 Each Prop 34 poster includes depictions of the Crucifixion of Jesus, with a message of transformation and hope. Proposition 36 on the Nov. 6th ballot would revise the three strikes law to impose life sentence only when the new felony conviction is serious, or violent, and authorizes re-sentencing for offenders currently serving life sentences. 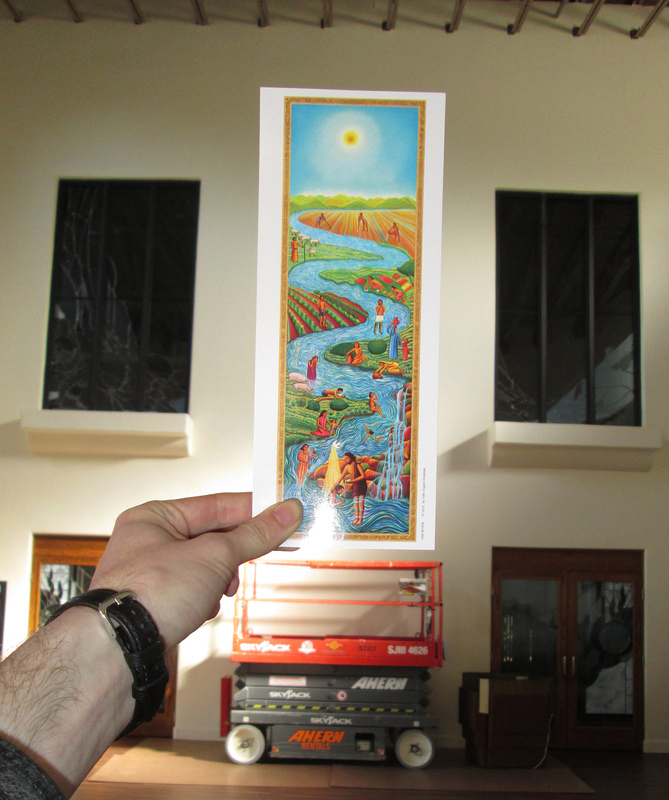 The Prop 36 postcard displays a powerful message of change for prisoners. These materials are available at printing costs. and postcards are $0.25 each plus shipping. 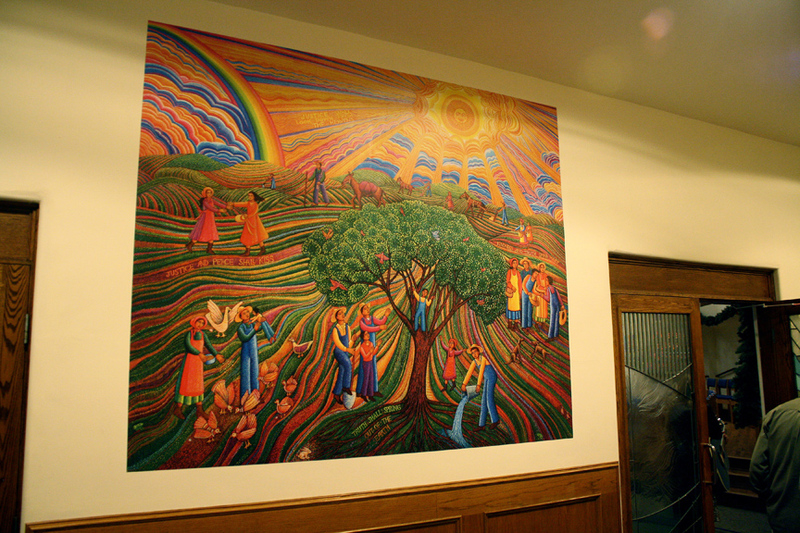 "The Art of John August Swanson "
located in the Art Chapel (North Ambulatory, near the Down Stair Case). 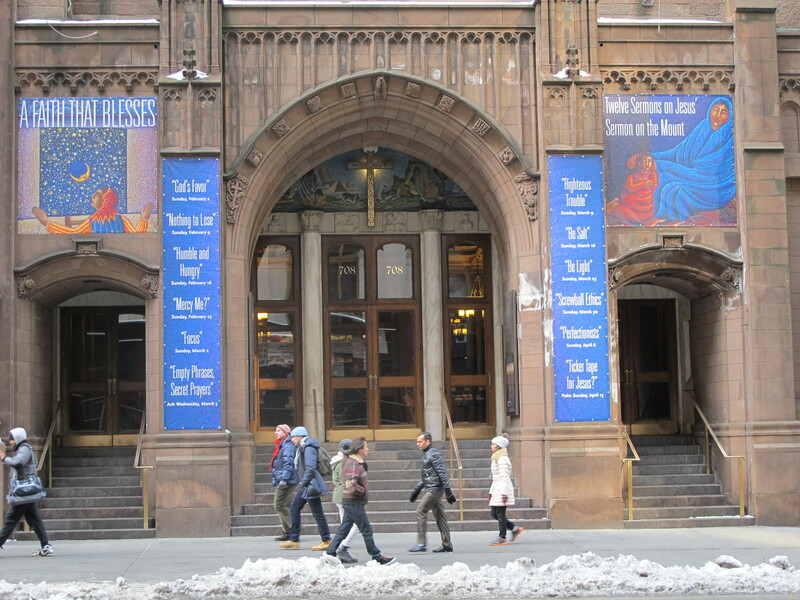 3 hours free with attendance at regularly scheduled masses followed by a flat fee of $5.00. 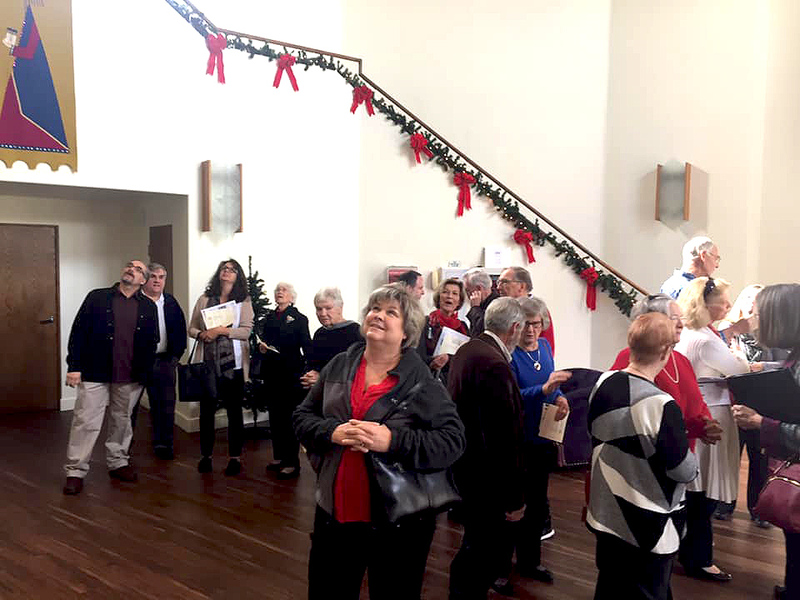 Tours are Available by Request. 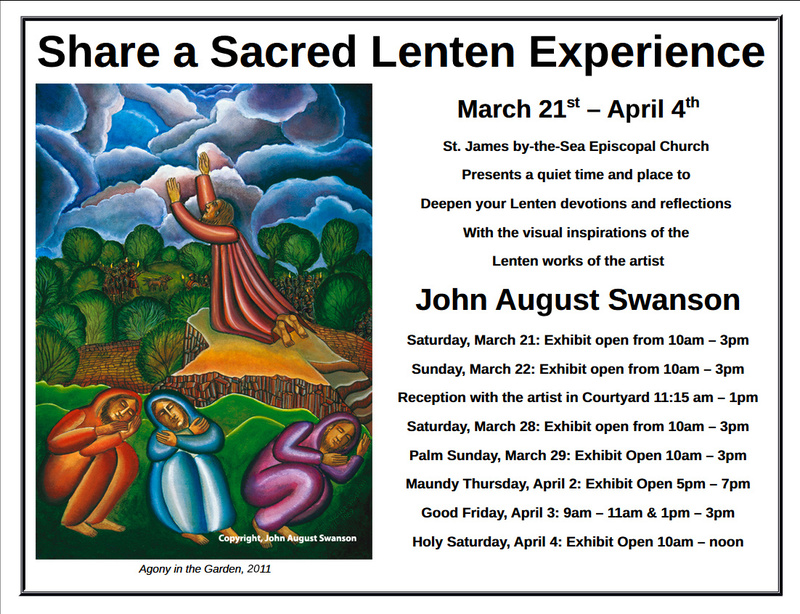 The John August Swanson exhibition at the Cathedral was reviewed by The Tidings on Friday, May 25th. To read the article, click here. 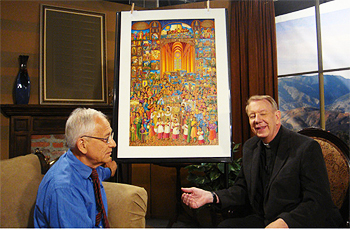 A 30-minute interview with John August Swanson at his Our Lady Of the Angels Cathedral exhibit will be aired on the West Hollywood Public Access Channel, WHPA - Channel 36. 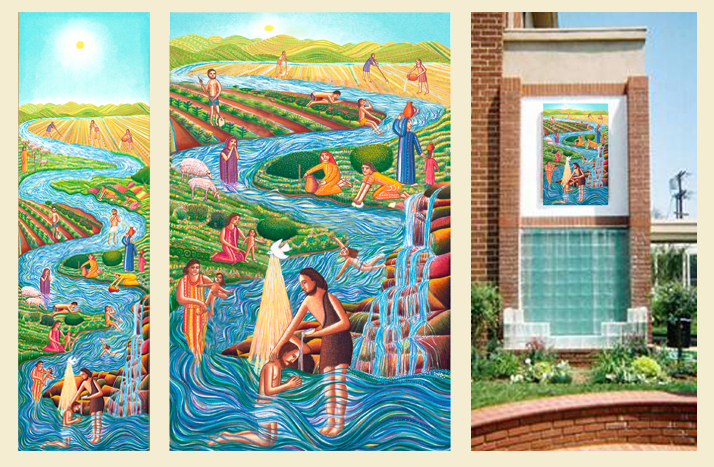 Click Here for more images of the completed mosaic. 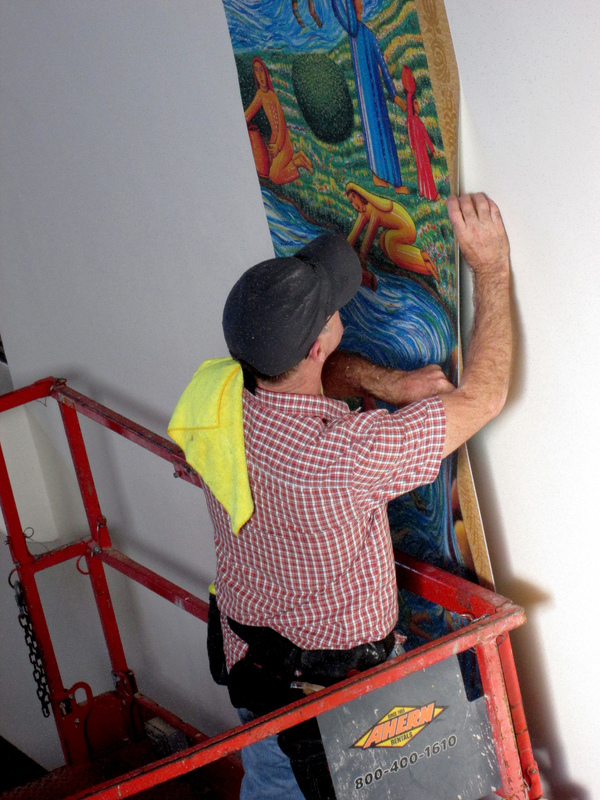 will unveil their new 4’ x 5’ mosaic adapted from John August Swanson’s 1987 serigraph, THE RIVER. 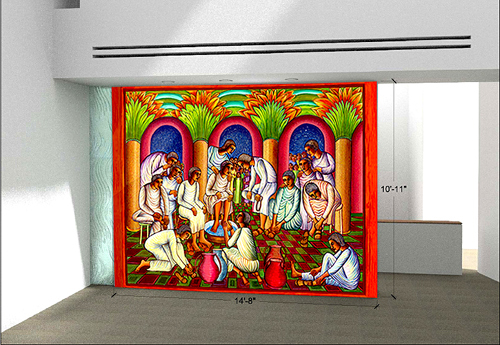 The mosaic will be installed above the church’s fountain in an area 6’ x 7’. 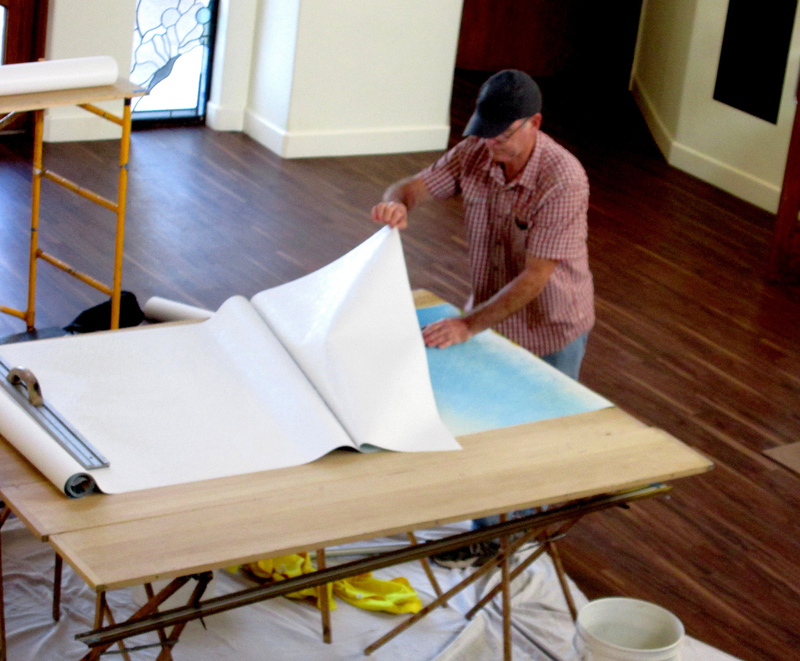 John August Swanson has overseen each step in the planning, adaptation, and re-sizing of his artwork. 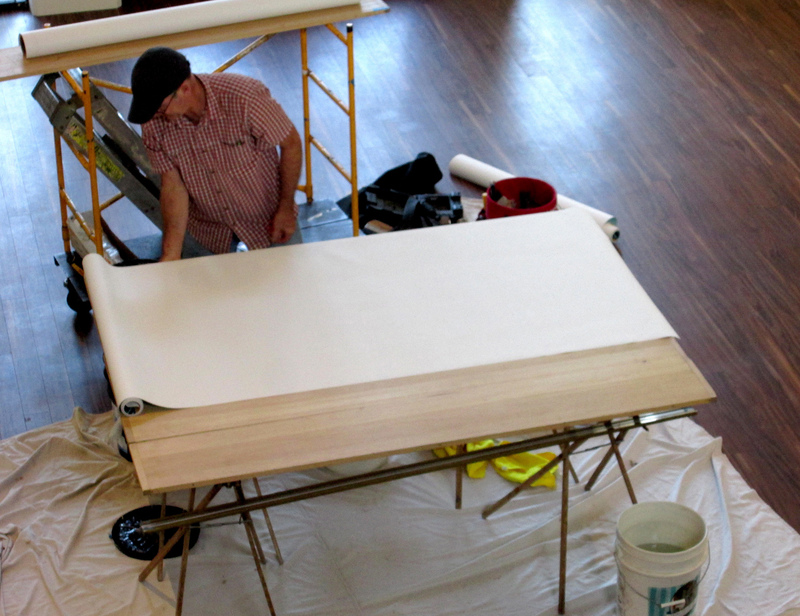 The final work was crafted by the Demetz Art Studio, located in Northern Italy, and family owned since 1872. And, the project was managed and facilitated by The Judson Studios, 200 South Ave. 66, Los Angeles, CA 90042. 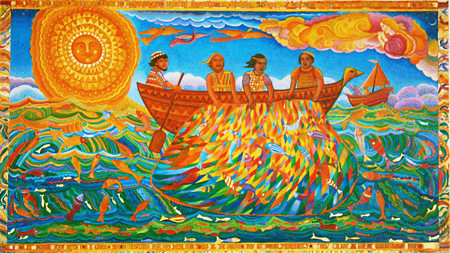 The Judson Studios had previously worked in conjunction with John August Swanson on a mosaic based on THE GREAT CATCH. At the left side of my serigraph, there is an employment agency with a long line of people waiting to sign on a waiting list. Our “Unemployed Man” is seen at the moment he writes down his name. He continues into the next panel, where he walks down the street, feeling alone and powerless, as he passes factories and office buildings with “No Jobs” signs posted. He is standing outside an overcrowded hotel where he has just picked up a newspaper which announces a march, a gathering of many people, of many communities coming together to address their common problems. He is the foreground figure in a huge gathering of people who have come together to call for quality universal healthcare, better schools, affordable housing, living wages, equal pay and job training. 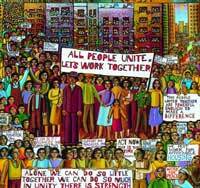 Many of their signs promote strength in unity, community organizing, and peace. 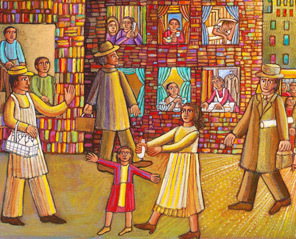 This large group of people is positioned so that they march toward the viewer as if they are moving forward out of the picture. The line of smaller scenes picture people engaged in the rebuilding and renewing of their community. 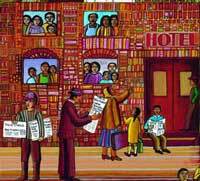 We see the renovation and construction of housing; the development of common, community spaces in parks; the writing of letters and expressing of ideas; and the sharing of resources in soup lines for the hungry, homeless, and unemployed. 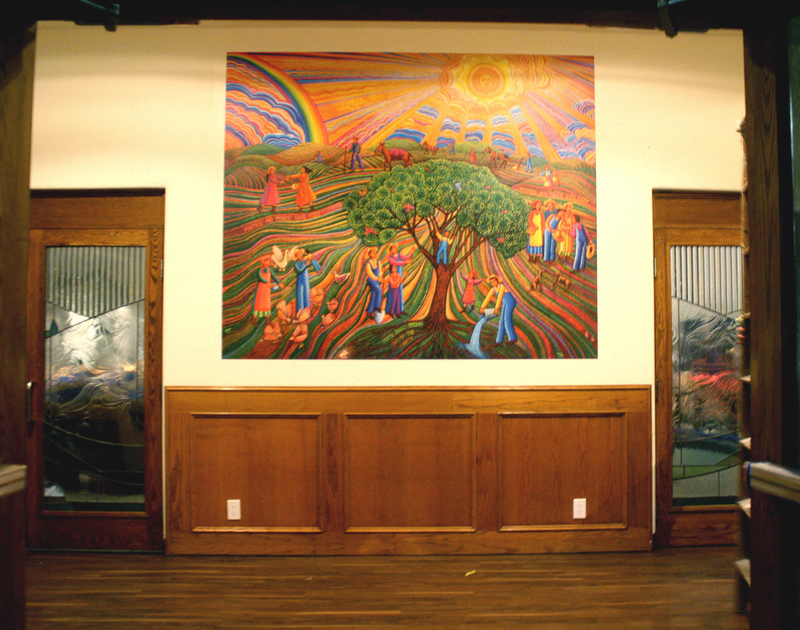 There are three scenes picturing people organizing for their empowerment. The first is a group involved in collective bargaining. The next is another group of people discussing the possibilities for working together. The final scene is a leadership training class in which they seek to learn how to combine their energies to solve common problems. 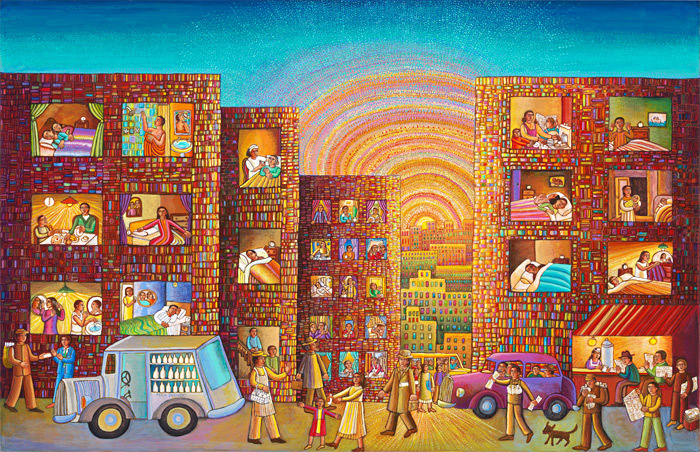 It is my hope that this art work might serve as an inspiration and a tool for those working to organize those who have been displaced & marginalized by economic injustice into compassionate communities empowered to implement justice and bring peace. 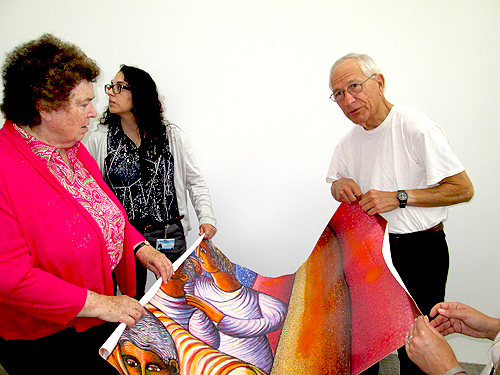 Giclee Print on Canvas, Size: 14.5" x 35.75"
a lecture by Candler professor emeritus Don Saliers. 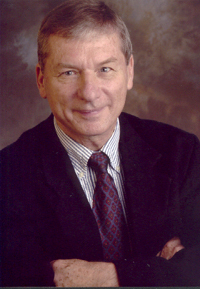 In the lecture, Professor Saliers will explore Swanson's visual narrative as visual spirituality through several examples of artwork. and often "musical" understanding of seemingly familiar scenes? followed by the lecture at 7:00 p.m. in the library's Durham Reading Room. 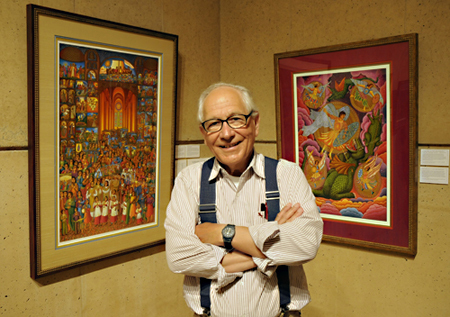 "The Art of Storytelling: The John August Swanson Collection"
on display at the Library, April 2–June 22. 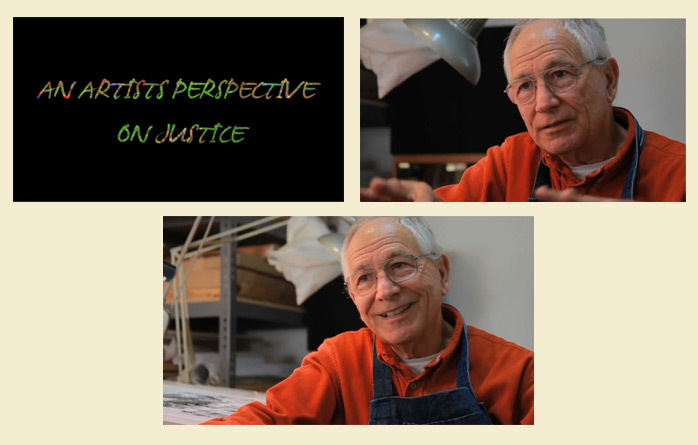 "Visiting Artists & Lecturers Series : John August Swanson"
with John August Swanson on Social Justice, and how it is reflected in his artwork. FOR WORDNET TV -- "Hues of Joy"
"The Power of Love". The Thirty minute interview will be broadcast twice later this year on September 25th and 27th. 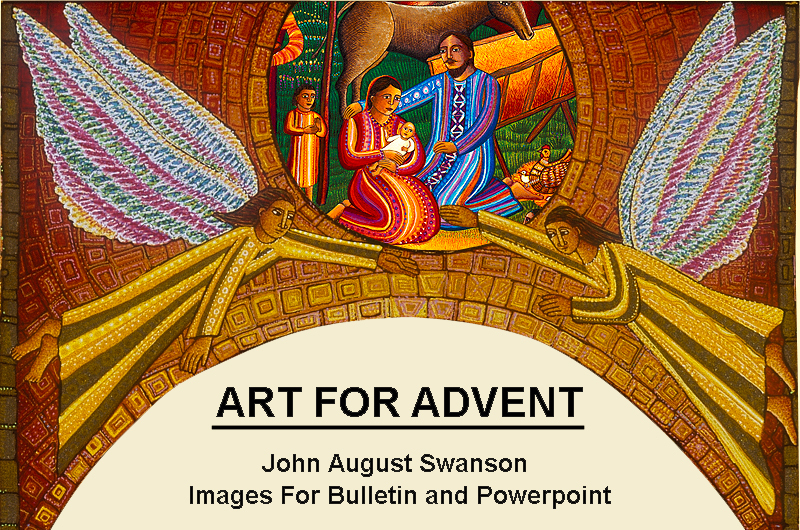 John August Swanson is working with Grand Rapids, MI based Eyekons to bring churches ART FOR ADVENT. 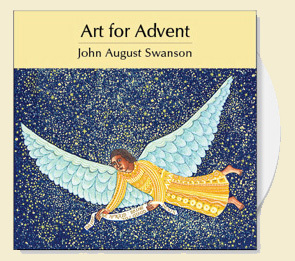 and features John August Swanson's six advent artworks. perfect for Powerpoint presentations and church bulletin covers. 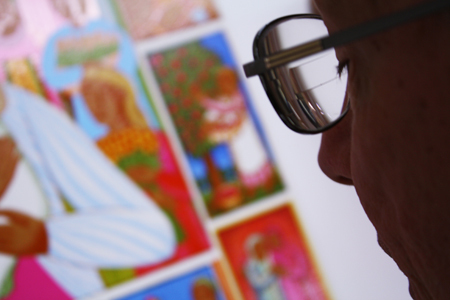 111 details of scenes from the serigraphs. Click Here to visit Eyekon's website for more information. 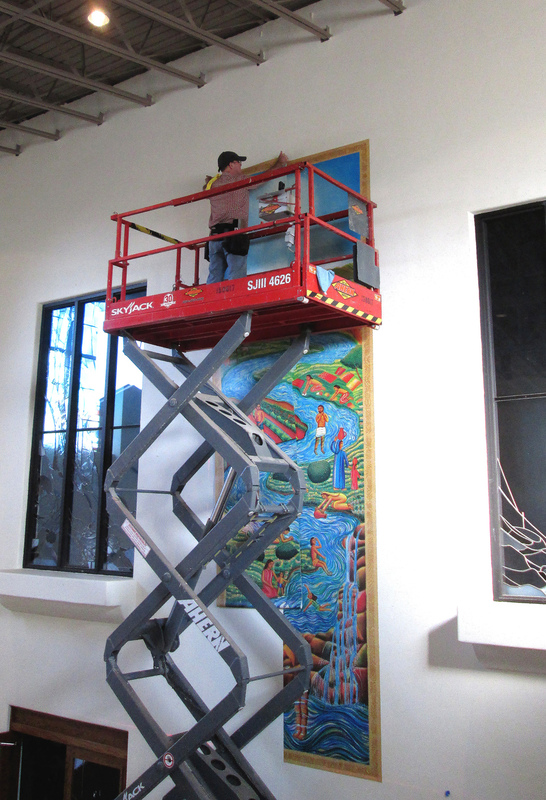 will feature a display of eleven original John August Swanson serigraphs in their Hubbard Library. 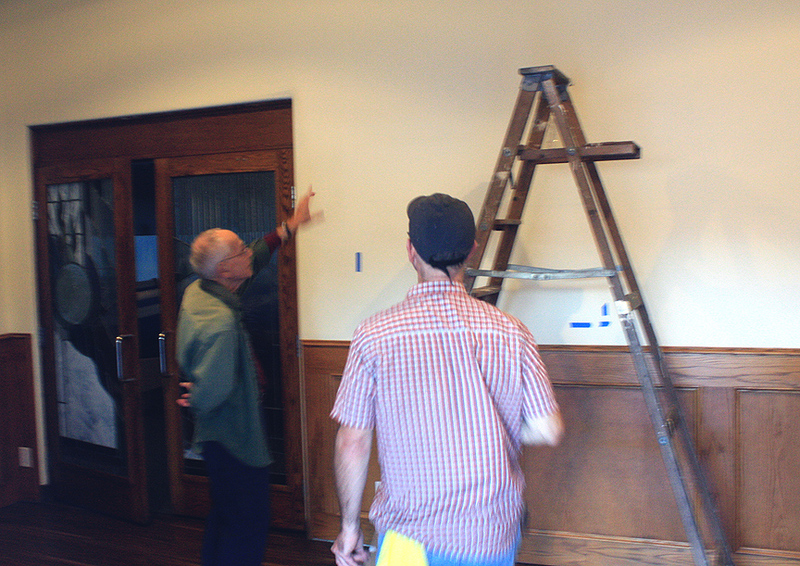 The event will include a near complete proof of Swanson’s newest work, PSALM 23. To begin the showcase, John August Swanson will appear at the opening reception on November 3rd, and give a talk later in the evening from 8:30-9:30pm. 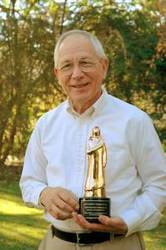 On November 4th, he will respond to a presentation given by Robin M. Jensen, Professor of the History of Christian Art and Worship at Vanderbilt University. 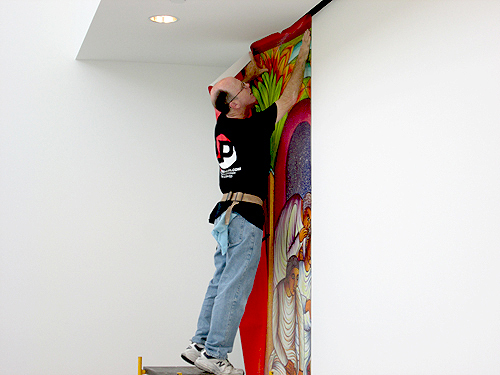 Lecture 1: Visual Art and the Two Reformations: Can We Find A Middle Way? Friday October 8, 2010 from 5pm-8pm. 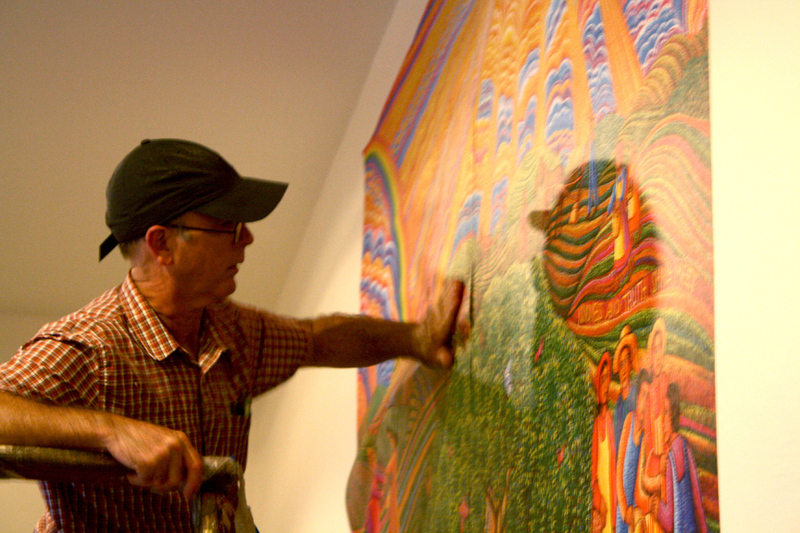 John August Swanson will speak from 6pm-7pm. 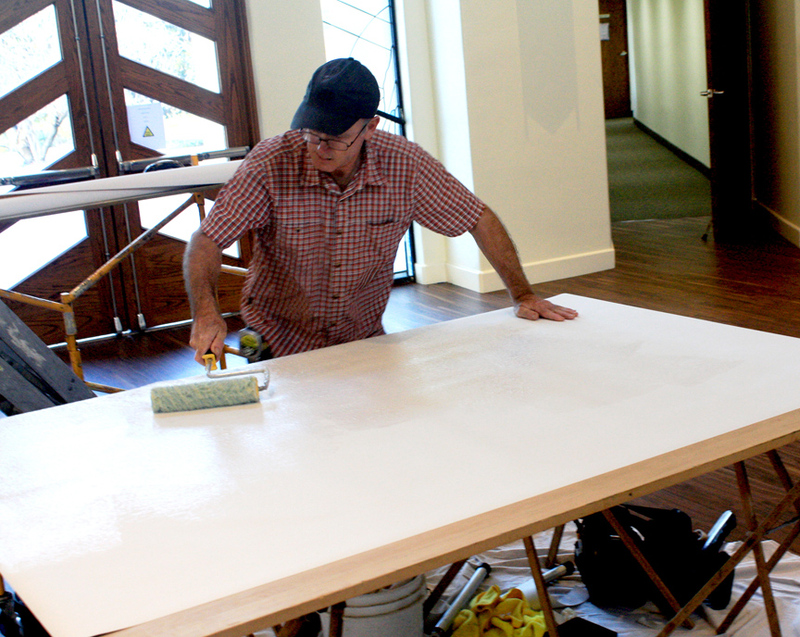 Featuring a sneak peak at PSALM 23, in progress! on the corner of Hennepin and N 17th Street in Minneapolis. the West Hollywood Public Access Channel, WHPA - Channel 36. 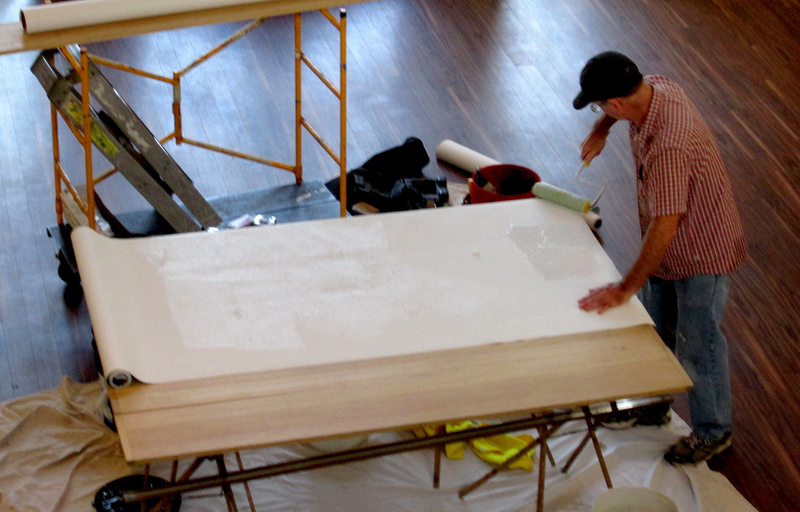 Tues., February 12, 2010 at 6:00 p.m.
Wed., February 13, 2010 at 6:00 p.m.
a new serigraph is taking shape. 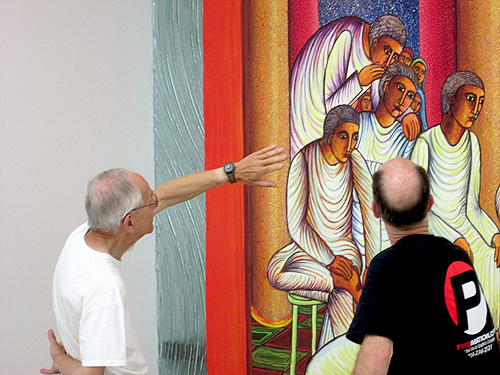 In 2009, Loyola Marymount University's Theology Department gave a symposium on the Theological Aesthetics of John August Swanson's artwork, which was later published this year in ARTS magazine. 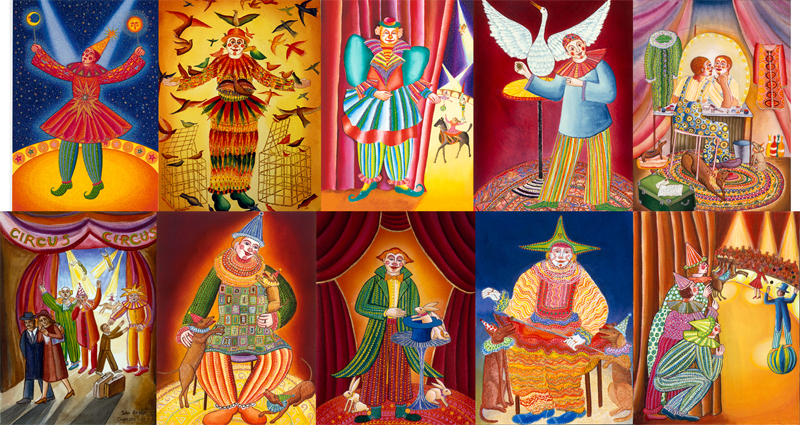 clown watercolor and acrylic paintings, created in the 1980s, and reinvented them as hand printed silkscreen serigraphs. 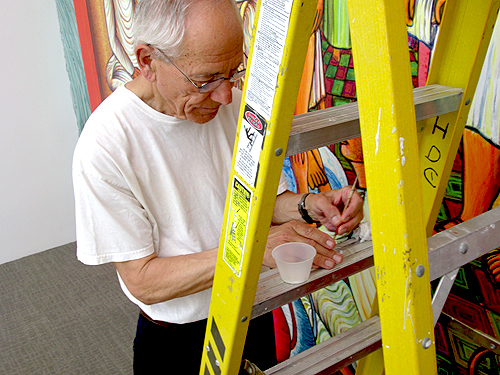 The first two were completed in 2008, please continue to visit the website for updates! The first in the series, STAR CLOWN, is available! 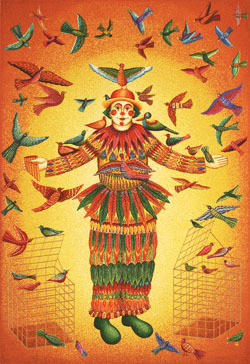 The second, PAPAGENO, is also available! The third, GOOSE WITH THE GOLDEN EGG, is NOW AVAILABLE! MAGIC RABBITS, ORIENTAL PRINCE, and WE'RE ON NEXT. 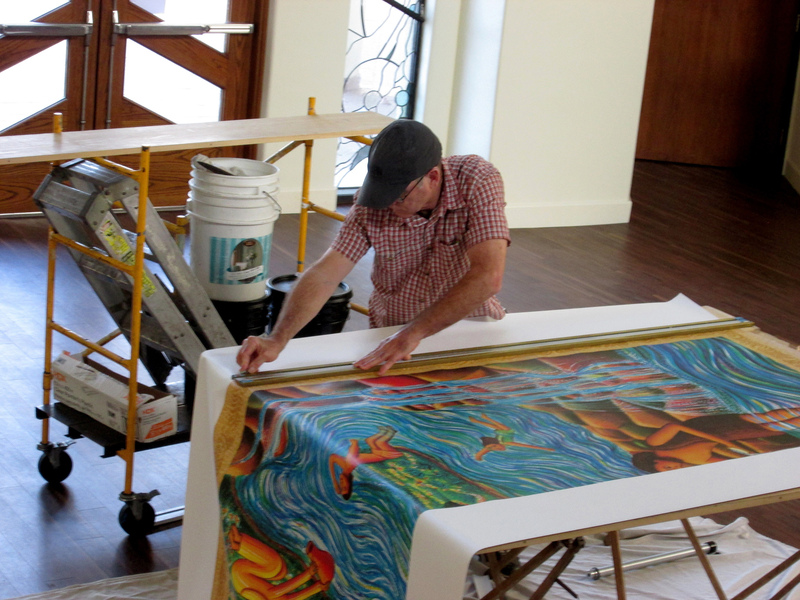 Mr. Swanson's work, SAINT MICHAEL AND THE ARCHANGELS will be on display, beginning in October, and continuing until the end of December. 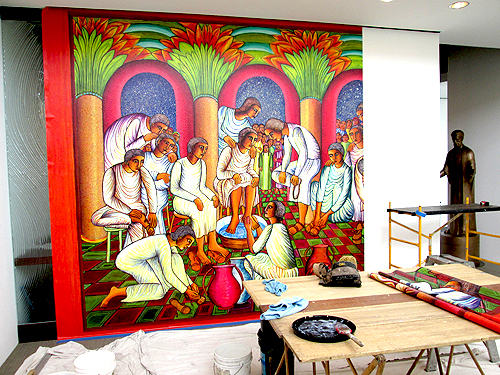 Los Angeles Cathedral of Our Lady of the Angels, "Looking Back, Moving Forward,"
Mr. Swanson has uploaded photos of work he is doing on his most complex serigraph ever. John August Swanson will be featured on this program, airing in the Greater Los Angeles Area on Time-Warner Cable Public Access Channel 98(Channel 43 in Beverly Hills, Channel 77 in Santa Monica). Check your local Cable program listings. Full cover page with three page full color article by Marta Caraballo p.12-13, p.19. 5:30 PM Thursday, Leature at Casa Guadalajara, 4105 Taylor St. Call for reservations due to limited space, afterwards he will be in the Gallery from 7:00PM - 9:00PM; 10:00AM to 9:00PM on Friday, 10:00AM to 4:00 PM Saturday. John August Swanson will be featured on this program, airing in the Greater Los Angeles Area on Adelphia Cable Public Access Channel 98(Channel 43 in Beverly Hills, Channel 77 in Santa Monica). Check your local Cable program listings. 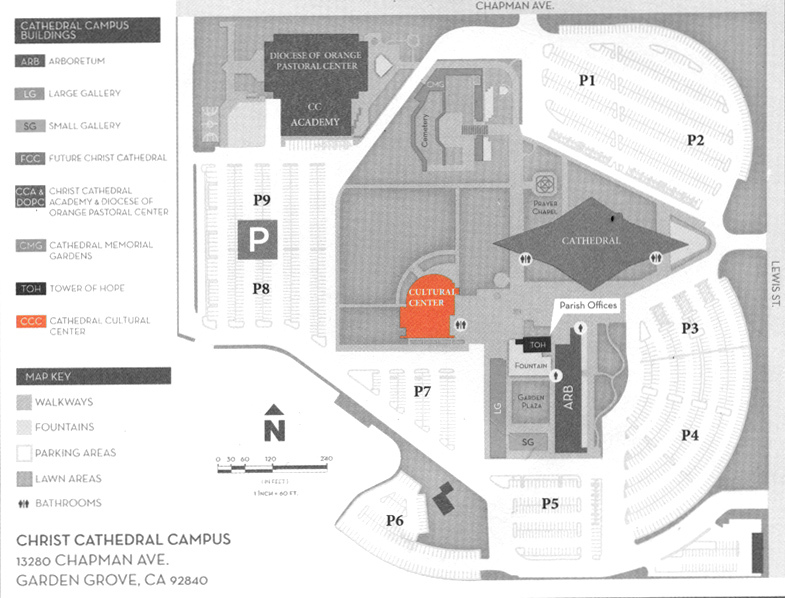 Donations in Memorium to Children's Hospital of Los Angeles requested. 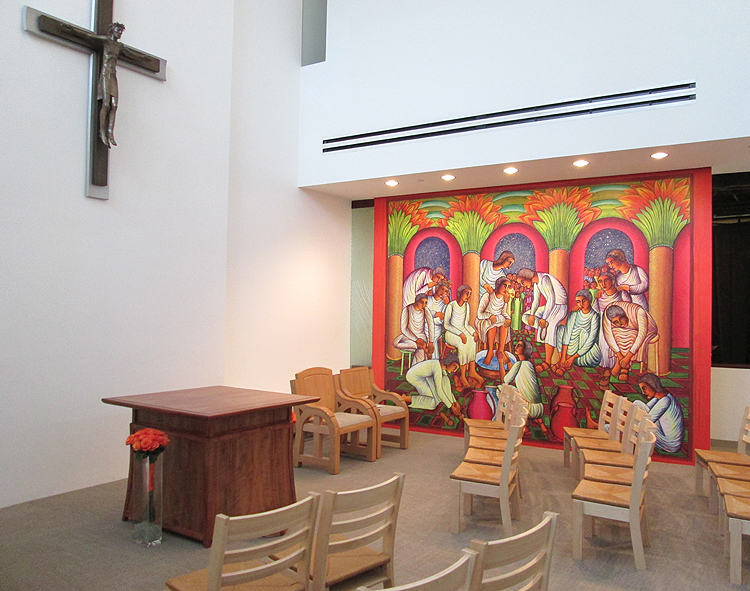 University of Southern California Religious Center, located on the North side of the University Park Campus on West 34th St. next to the Student Health Center. 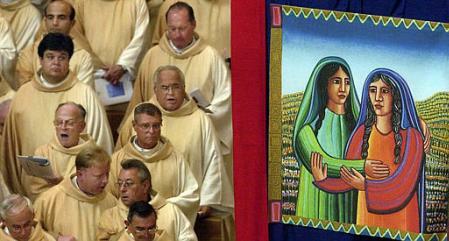 The processional banners for the dedication and opening of Our Lady of the Angels Cathedral featured the art of John August Swanson. 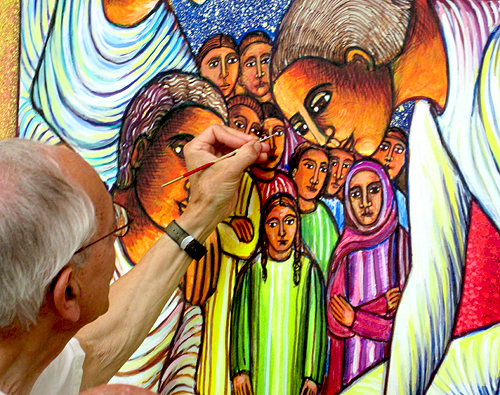 Orbis Books, publishers of There Is A Season, is releasing a new book using John August Swanson's painting FRANCIS OF ASSISI (1999). 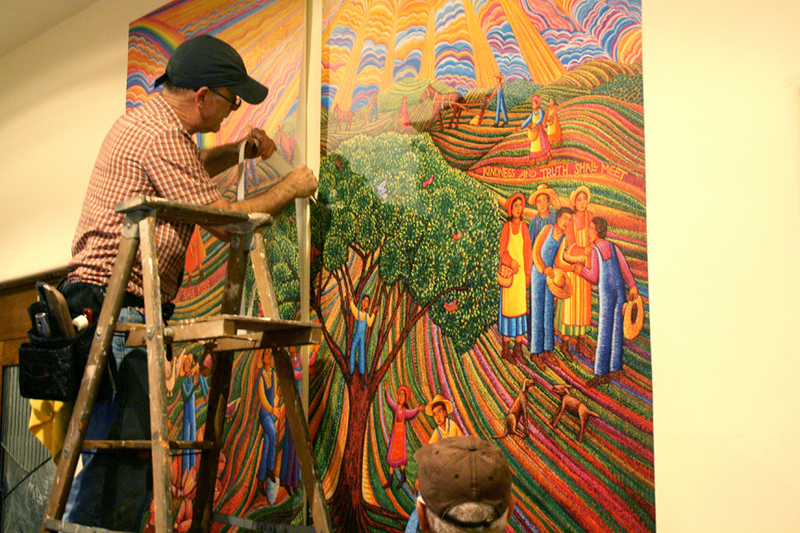 This painting has a border of 24 miniature scenes from the life St. Francis. 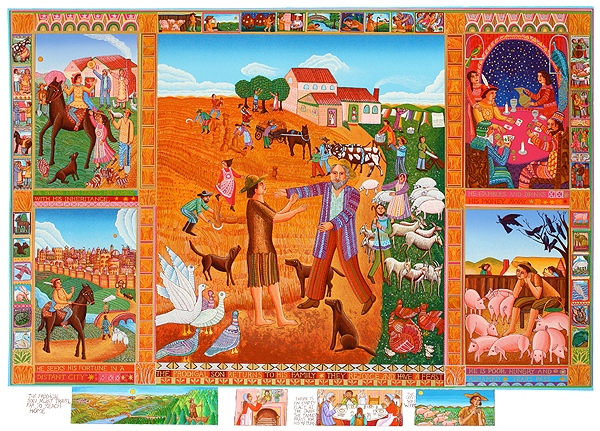 The larger central panel shows St. Francis looking out over a landscape of forests, various animals and birds, rolling hills, and towns. 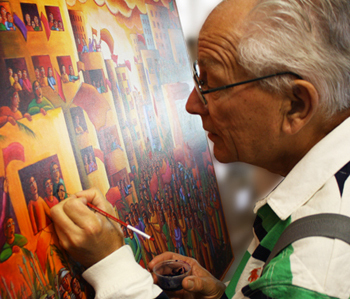 The more than 60 full color inllustrations in the new book are taken from this complex painting, exploring the intricate details. 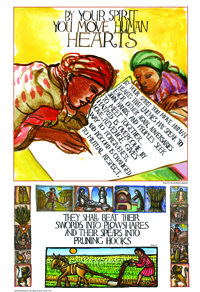 The text of the new book consists of reflections on panels and details of the art written by Marie Dennis, an author working in the field of social justice. Her inspiring words present a man reaching out and caring for others as a model for all people today. 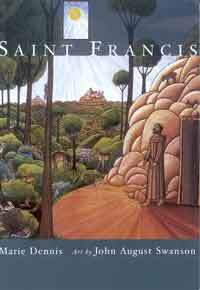 A comment by Sister Wendy Becket on this new book: "These lovely qualties [of St. Francis] are not only explained but made visually present in the rich, strong pictures of John August Swanson, on which Dennis bases her text." It will be available at bookstores and can also be ordered from the publisher Orbis Books at 800-258-5838. The cost will be $25.00 plus shipping.